I remember this quote from a long time ago. It always reminds me to never give up searching for my own niche, my own happiness. 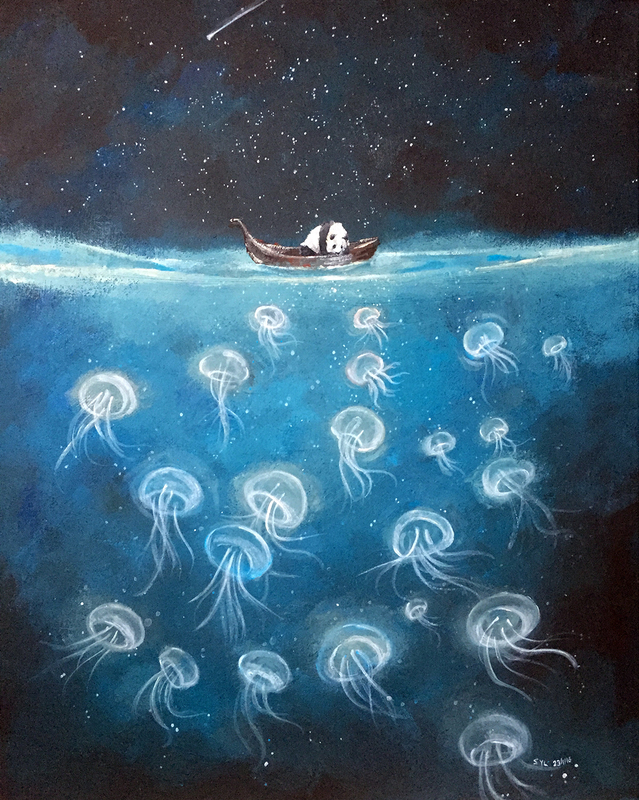 Fish for a wish is a continuation from my previous piece “Counting Shleep.” If a dream is a wish our heart makes, and every star in the sky is representative of a wish. I imagine that there will be millions,upon trillions of stars in the sky to symbolize the hope and happiness for all of humanity. So whether you wish upon a star tonight, or you are still searching for your dream in life, have a sweet and beautiful dream. Keep fishing and keep searching, you will know when you find what is right. 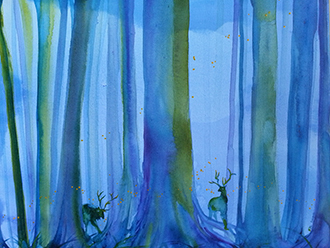 I’m not sure if it is visible in this photograph, but I chose to add some silver paint for the stars. I hope they will glisten at just the right angle when you are looking at it. 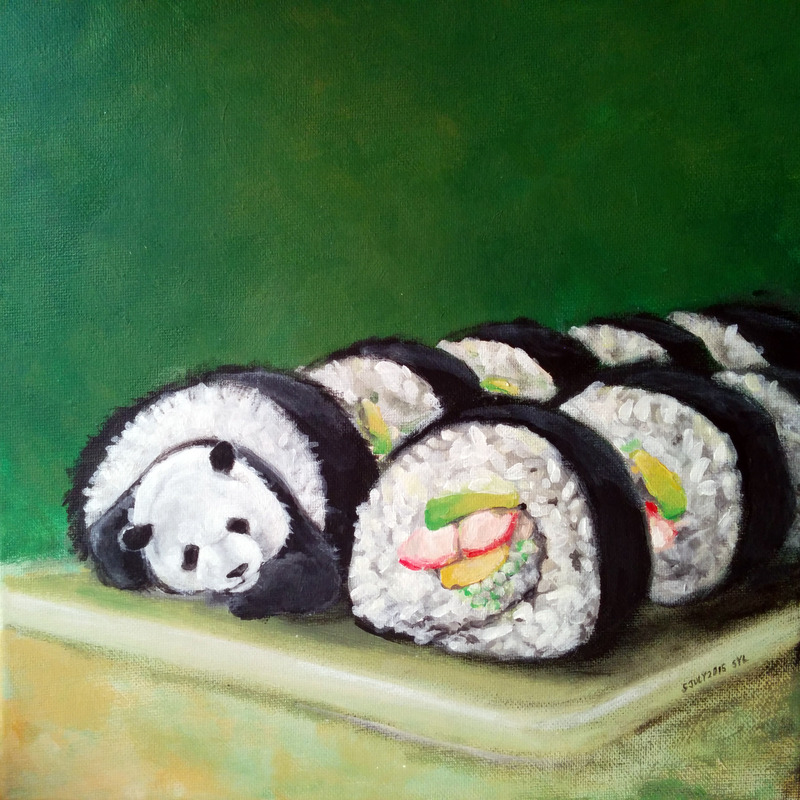 This painting is currently on display at Sakura Sushi. 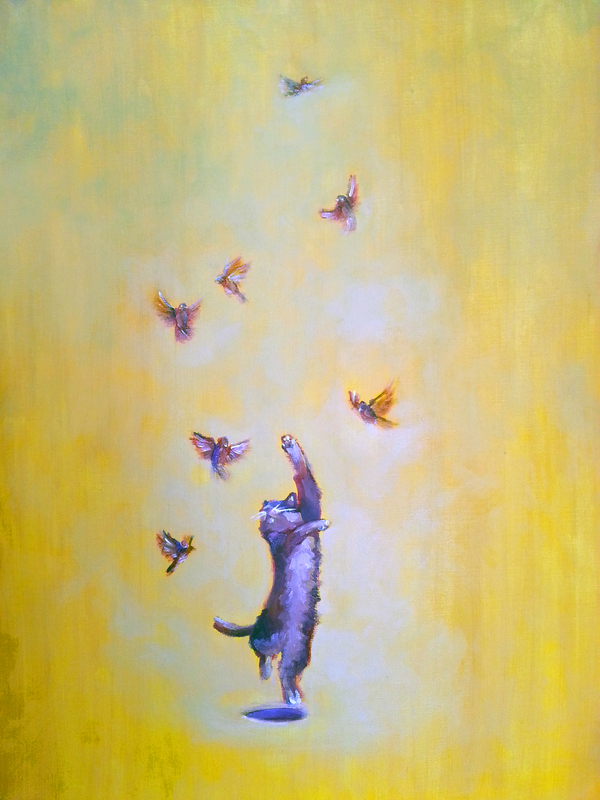 Words can’t describe how happy I was when I first thought of the idea for this painting. 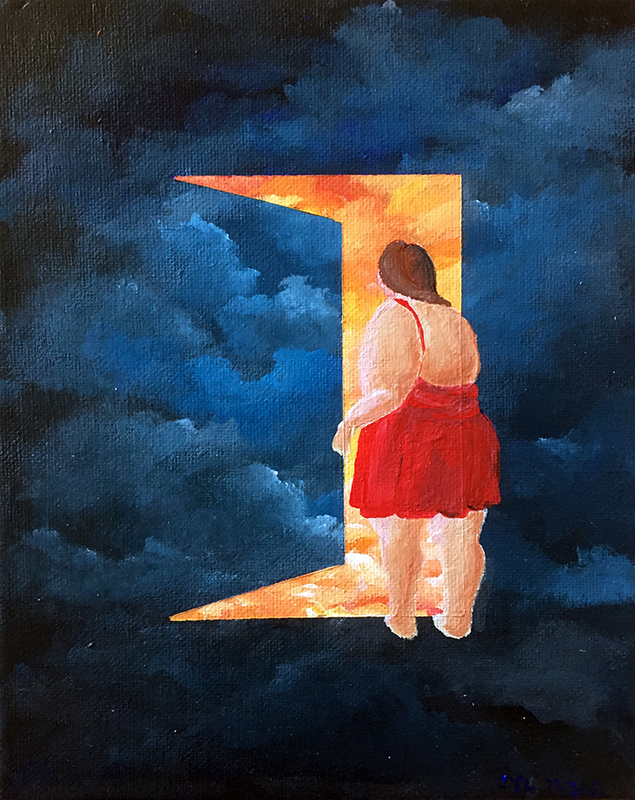 It just popped into my head in the middle of the night and I just couldn’t stop painting throughout the night. I wanted to convey the feeling of warmth and coziness when you hit the perfect spot while lying in bed. The feeling when you are at peace and rest at the same time. 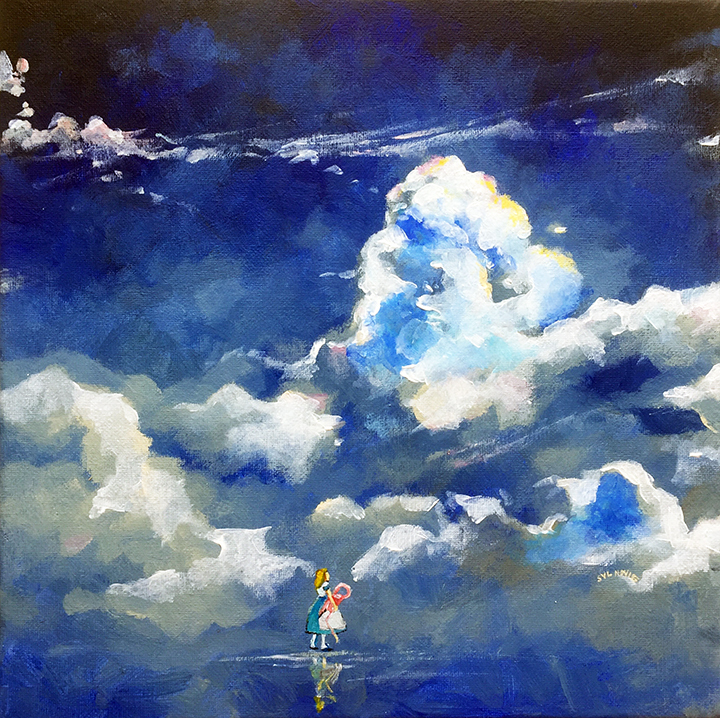 Looking for wonderland is another piece that stemmed from my latest Alice in Wonderland obsession. Aren’t we all looking for our own wonderland? Here’s to never giving up in our search for true happiness! 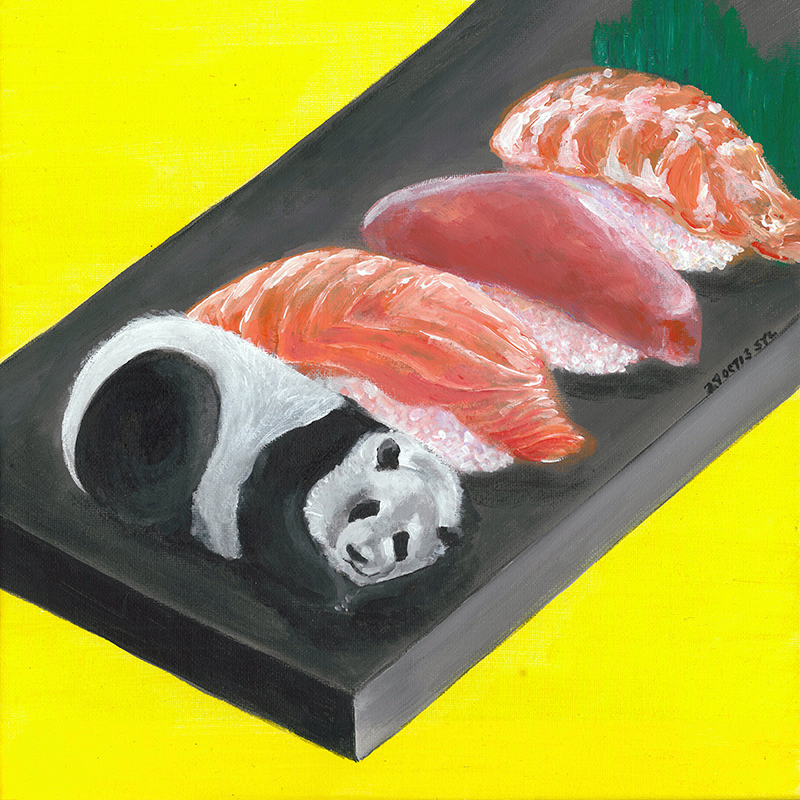 This painting was on display at Sakura Sushi. 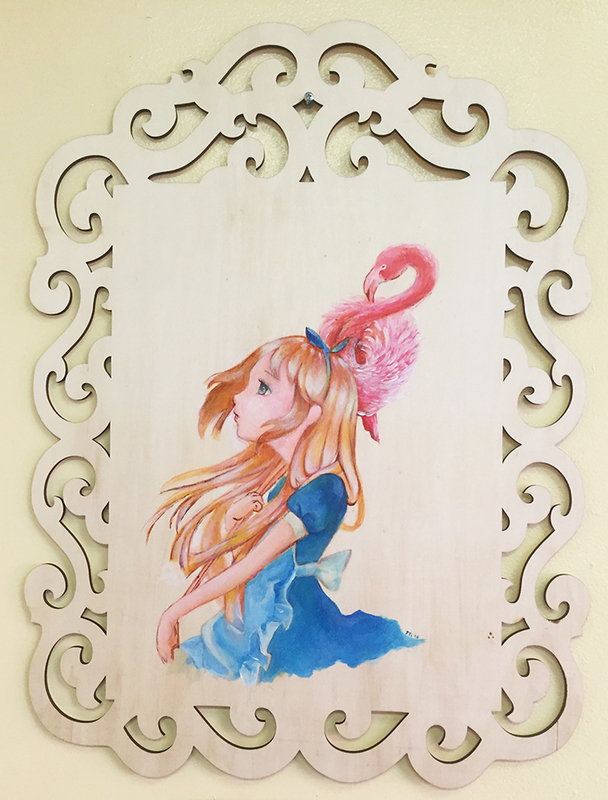 Pondering is a piece that stemmed from my latest Alice in Wonderland obsession. 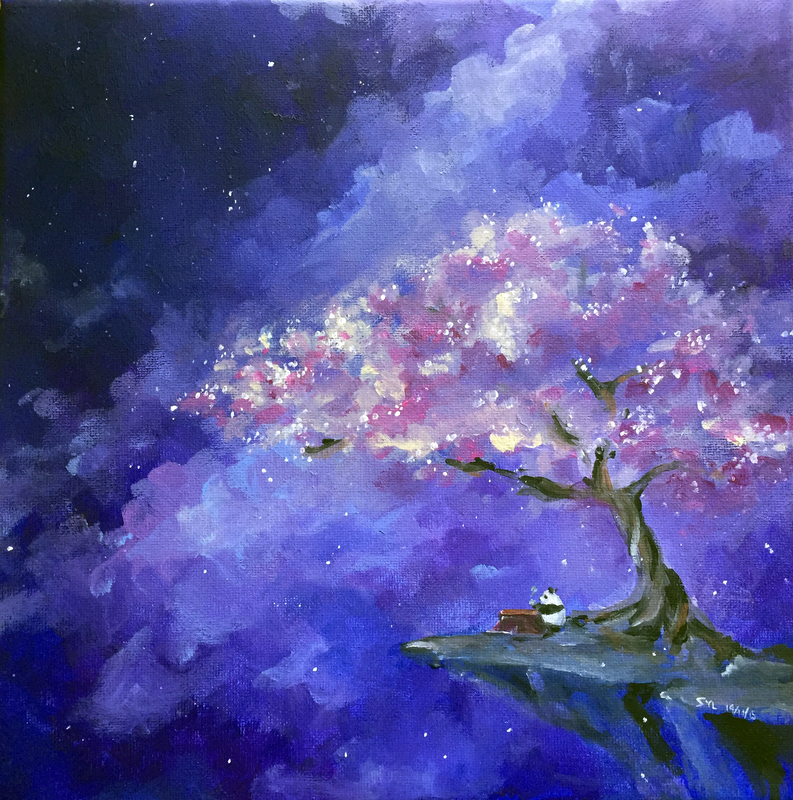 I feel so free when I look at this painting. My second piece combining disney with specialty drinks. 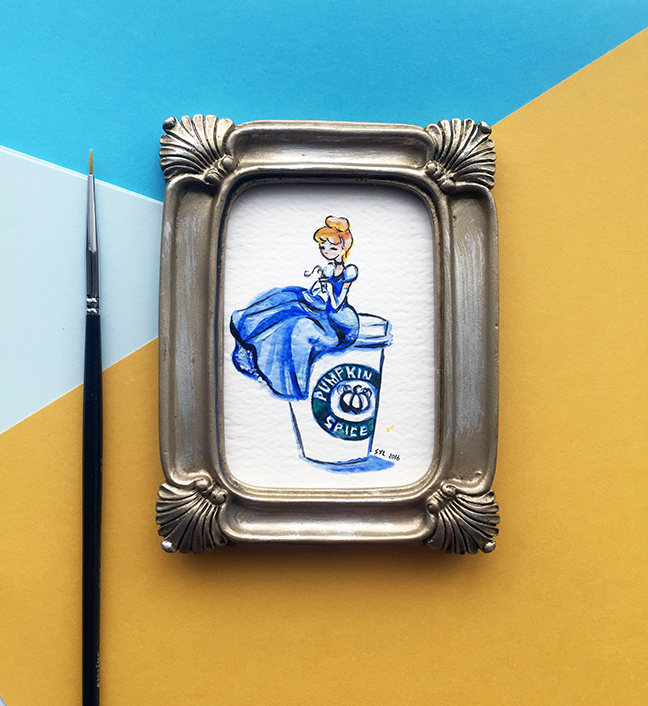 If I had to guess Cinderella’s favourite drink at Starbucks, I would have to say PUMPKIN SPICE LATTE! This is my first disney fanart combined with specialty drink series. I’ve been alittle obsessed with the Alice in Wonderland theme lately, and I really like the idea of how the story started with the glass bottle & the “drink me” tag. 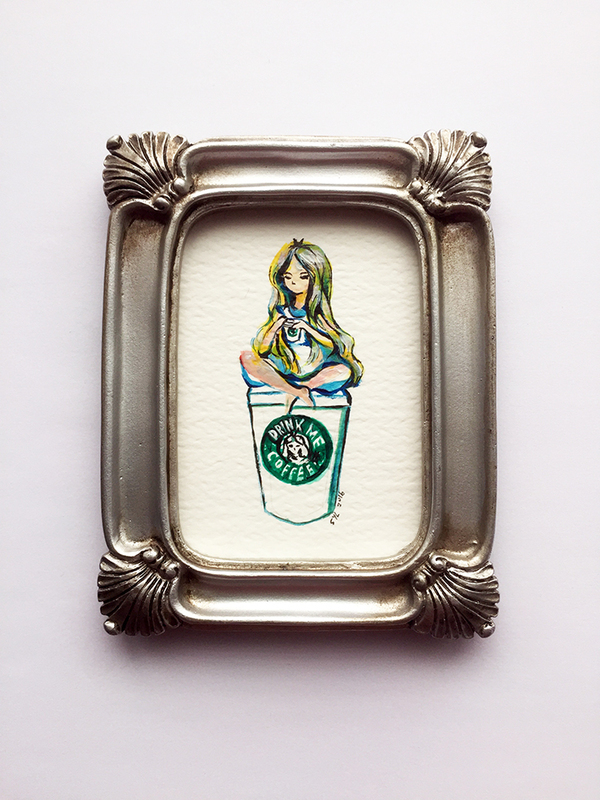 Since it’s Monday morning, I thought it would be nice to combine the starbucks coffee theme with the “drink me” AIW theme. 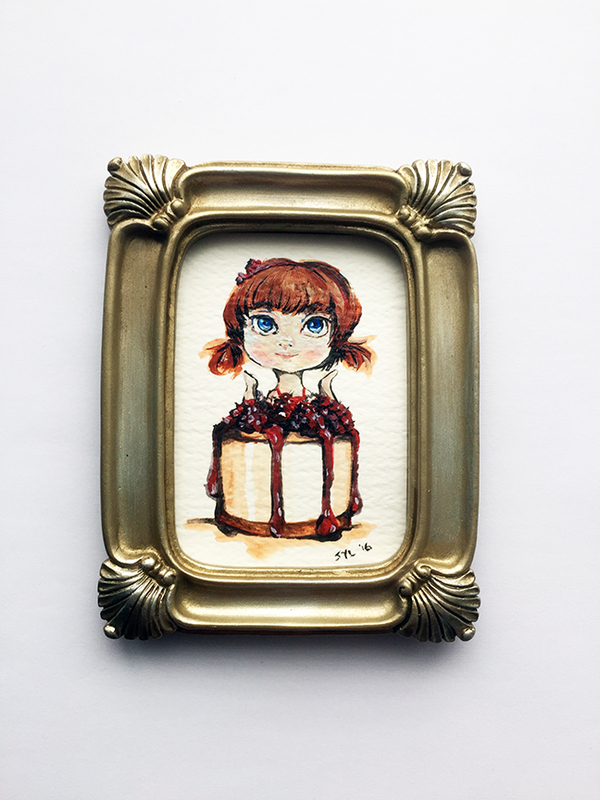 This is my last piece in my series of chibi dessert characters and also my 1 of 2 two square shaped pieces in this series. Hope you enjoyed it. As you can see, I have now evolved from painting desserts paired with chibi characters to integrating their clothing to be a dessert theme. This is my attempt to paint a strawberry themed outfit. 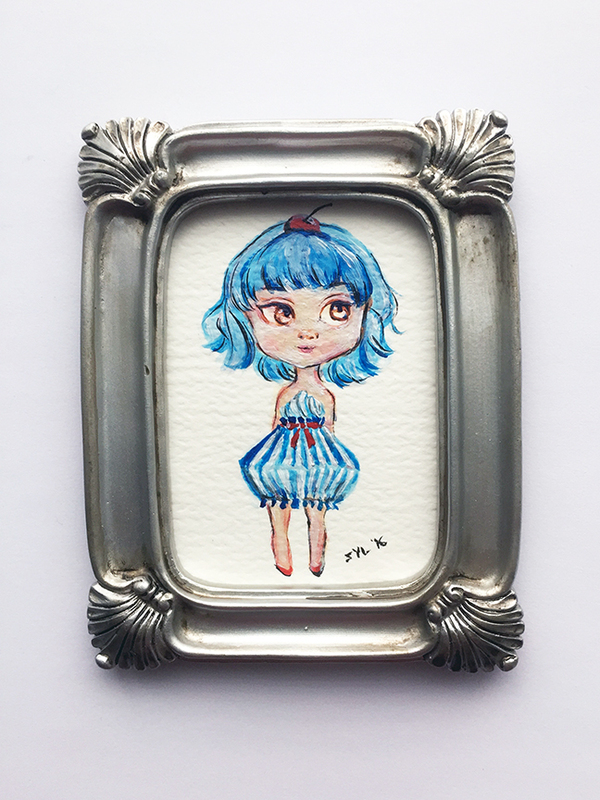 Found these beautiful mini frames at the local craft store, so I thought that I would try to produce a mini series of small acrylic art pieces. This is my second attempt at creating a chibi themed characters combined with delicious desserts. I was much more satisfied with this attempt. 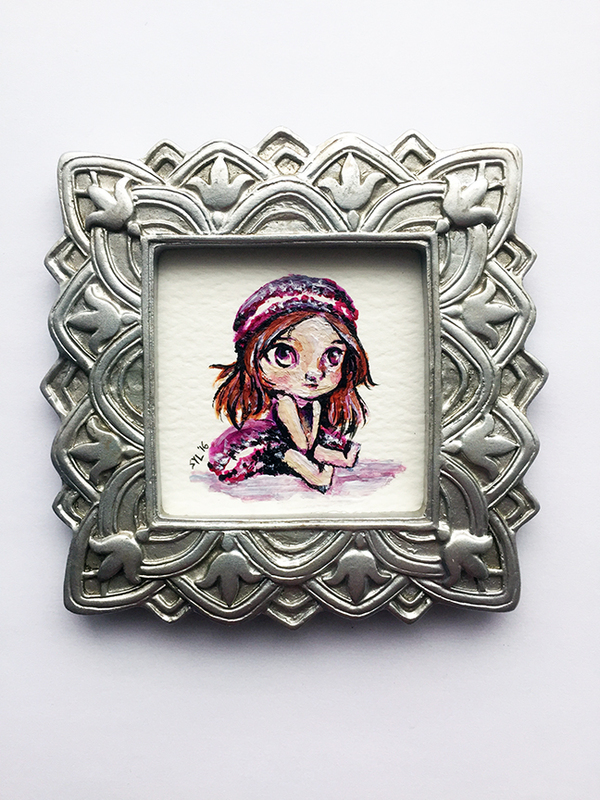 Found these beautiful mini frames at the local craft store, so I thought that I would try to produce a mini series of small acrylic art pieces. This is my first attempt at creating a chibi themed characters combined with delicious desserts. 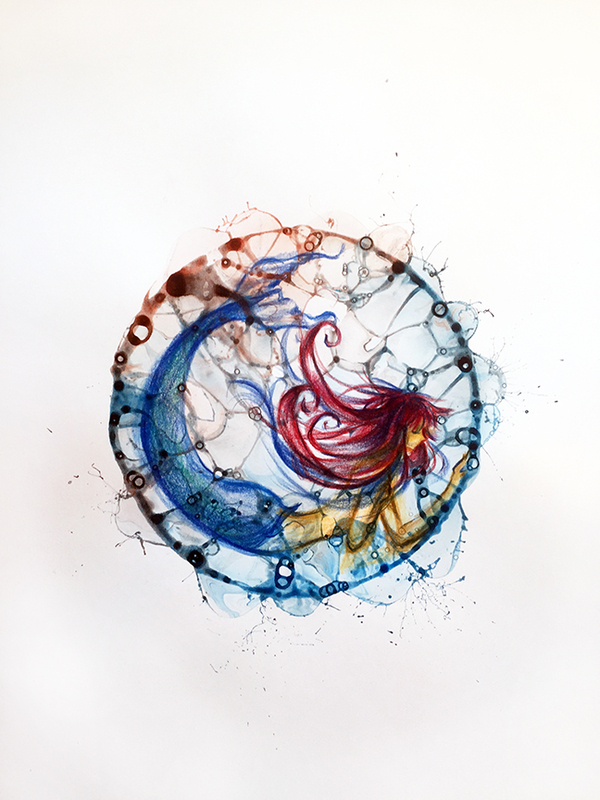 Loving the effect of how the bubbles burst, leaving behind these beautiful splash marks. So spontaneous. I like admiring how the acrylic bubbles turn out in these pieces. Each piece unique and can never be replicated. 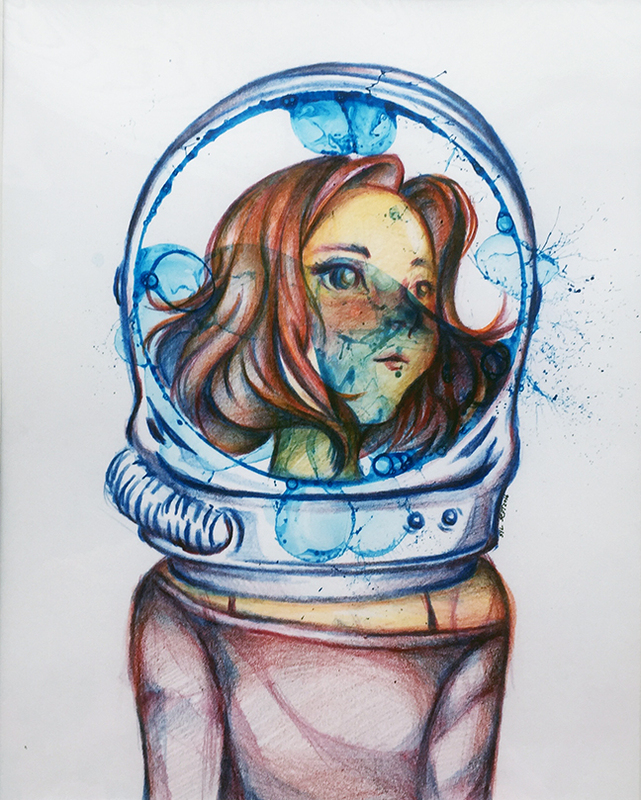 Another attempt at integrating acrylic medium with pencil crayon on the same art piece. I like how the two mediums blended into each other so nicely. My second in a series of acrylic paintings on wooden plaques. I am definitely getting a better grasp of this painting style. 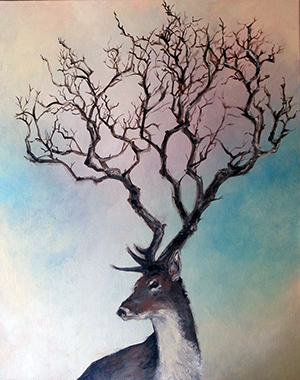 Happy with how the colour scheme of subtle white flowers blossoming on the this deer’s antler. 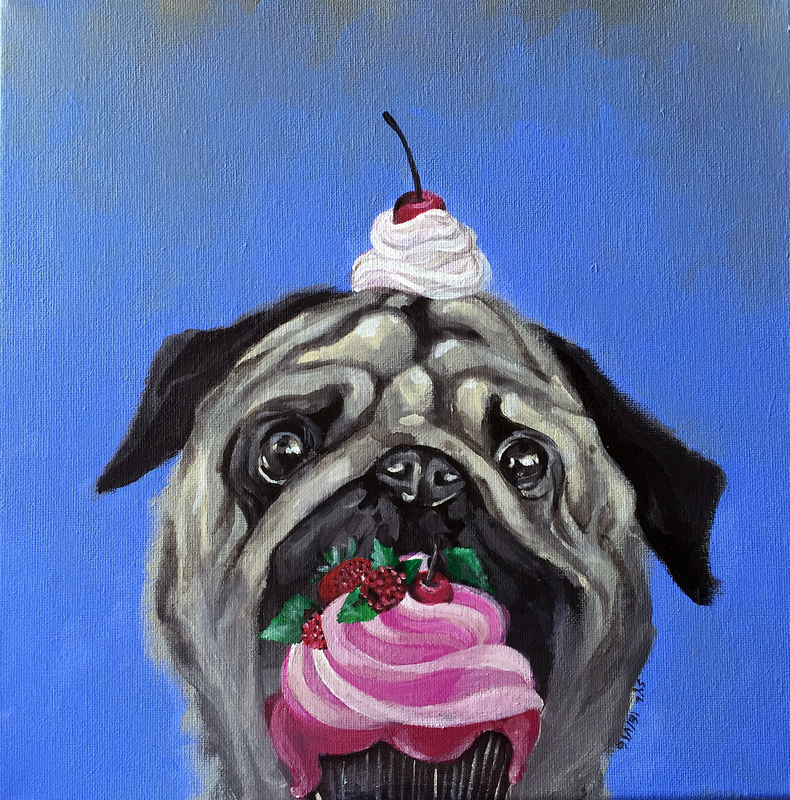 My 1 of three acrylic paintings that I will be producing on wooden plaques. 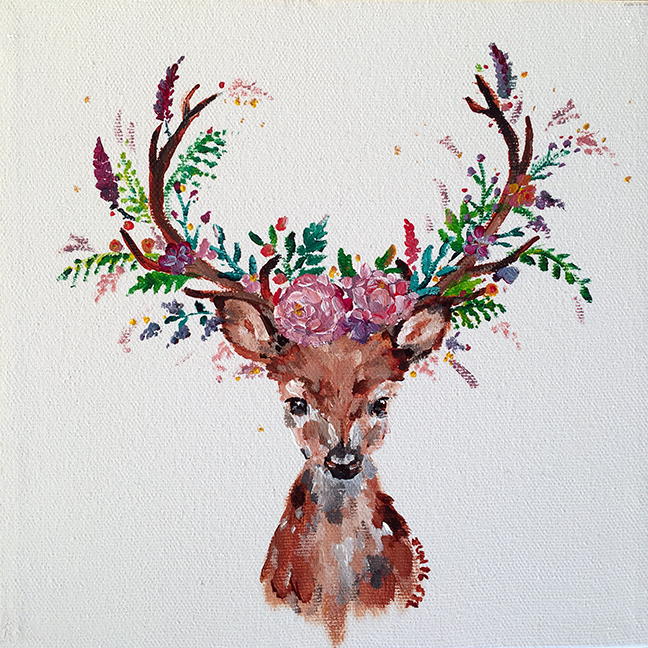 Found this beautiful wooden panel and was instantly inspired to try painting on it! 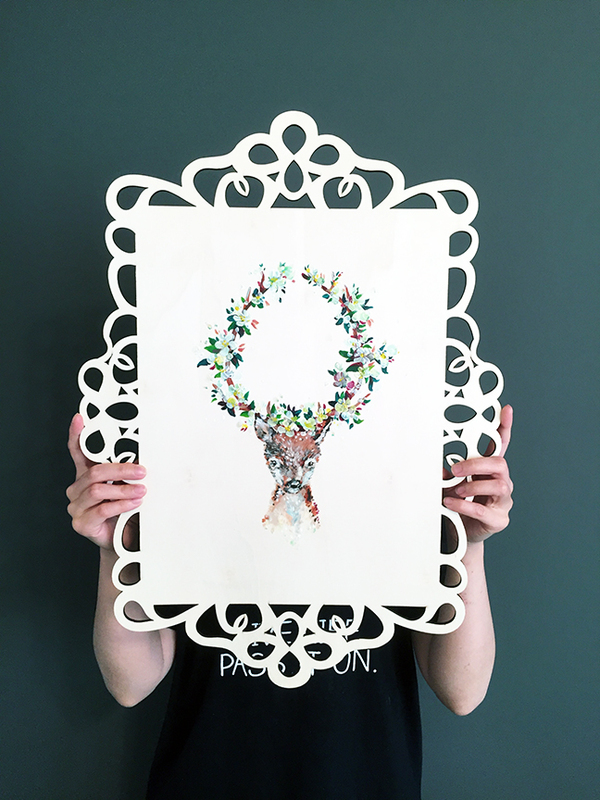 I thought that the decorative cut-outs along the frame of the panel reminded me of an earlier piece that I did this month. 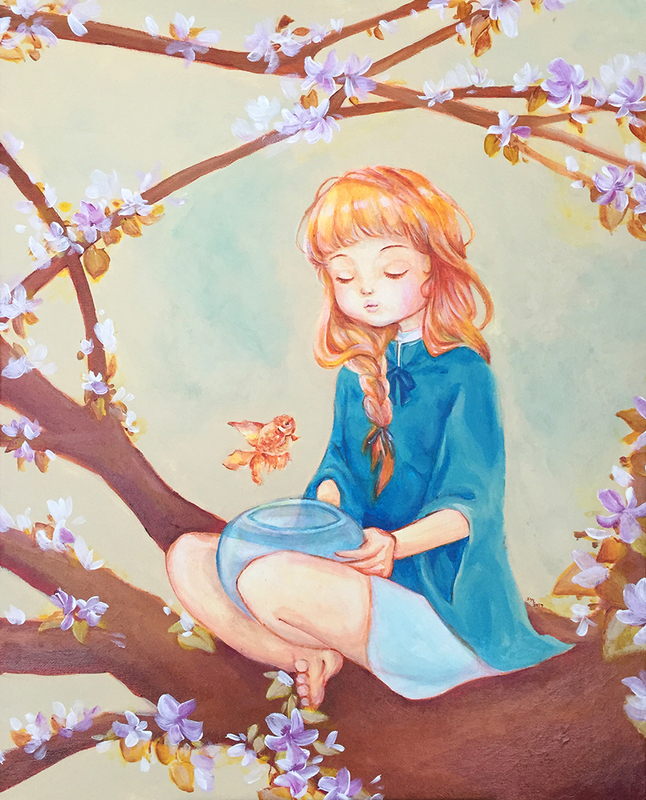 It’s a piece that I’ve been itching to paint for a long time! 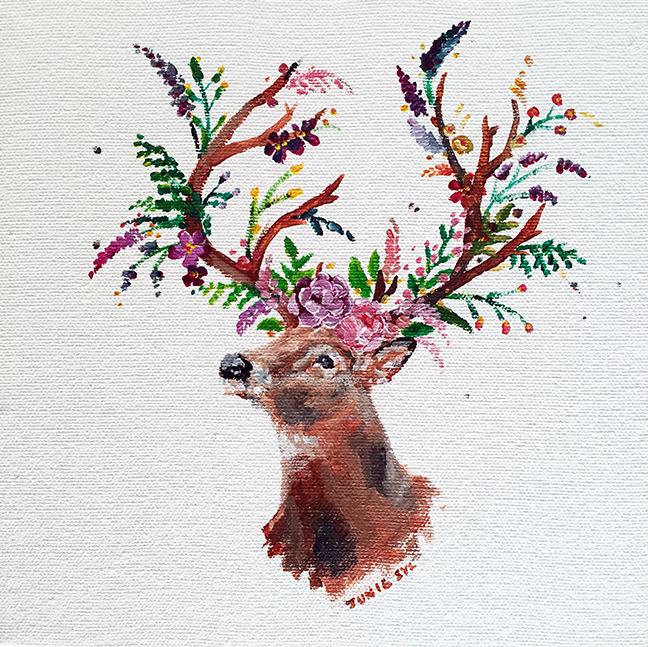 Summer is perfect for some floral arrangements on deer antlers. 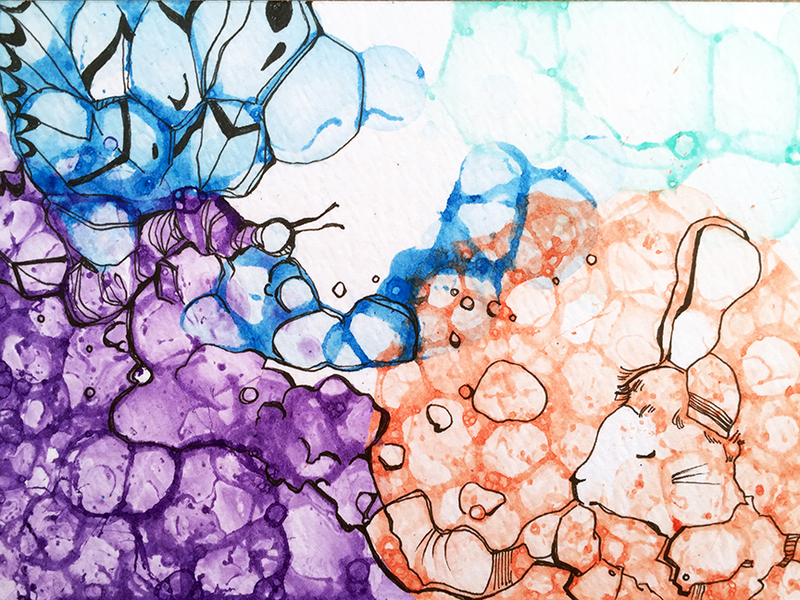 My second attempt to perfect the skills of incorporating pencil crayon in the acrylic soap bubbles. 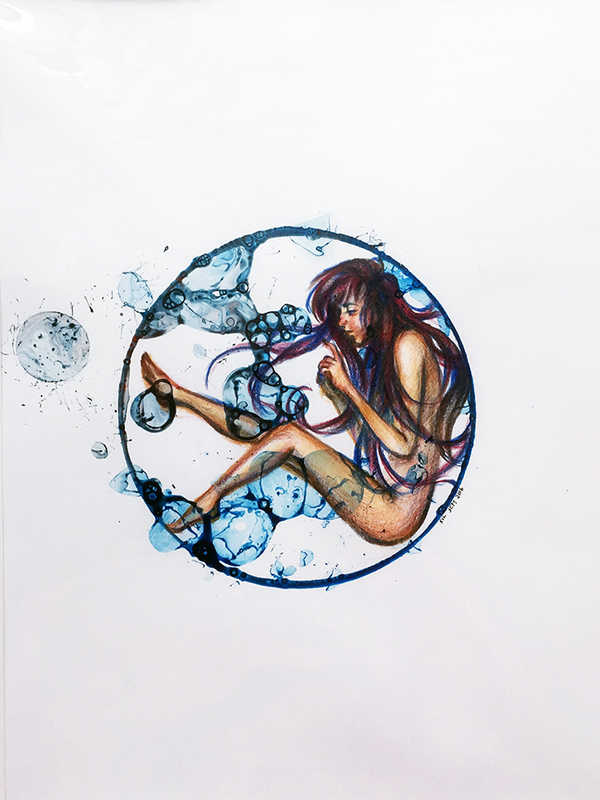 Absolutely love the mermaid held inside a giant soap bubble. It’s such a precious moment that makes time stand still and you sometimes need to remember to breath. This was the moment when I fell in love with soap art. 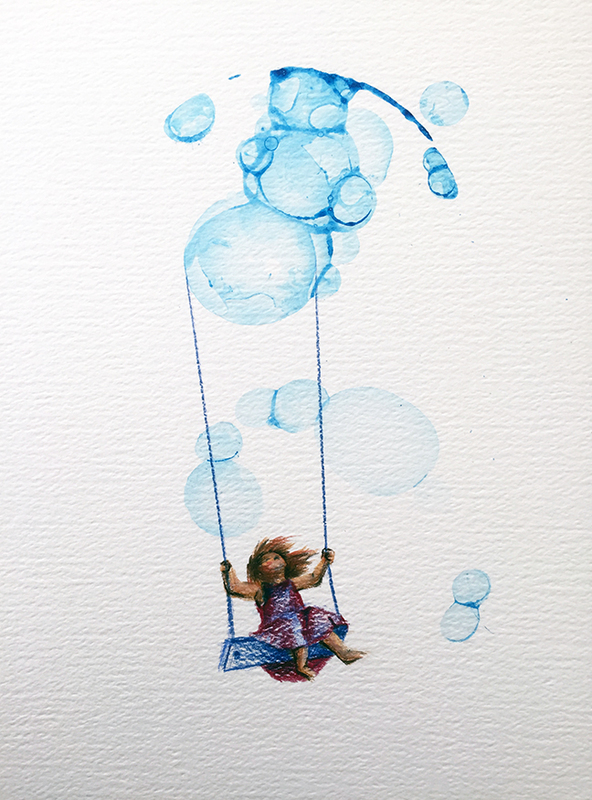 Love how the pencil crayons blended so nicely together and incorporated itself into the soap bubbles. This was a magical piece for me. Something precious. My first attempt at incorporating pencil crayons with soap art. The process is still so delicate at this stage. 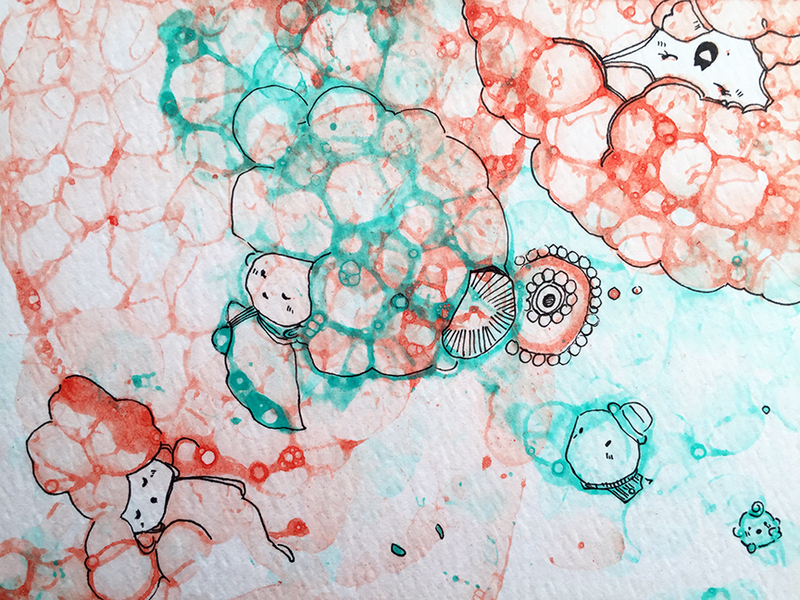 Sweet dreams is one of my first attempts at doodling with soap art. 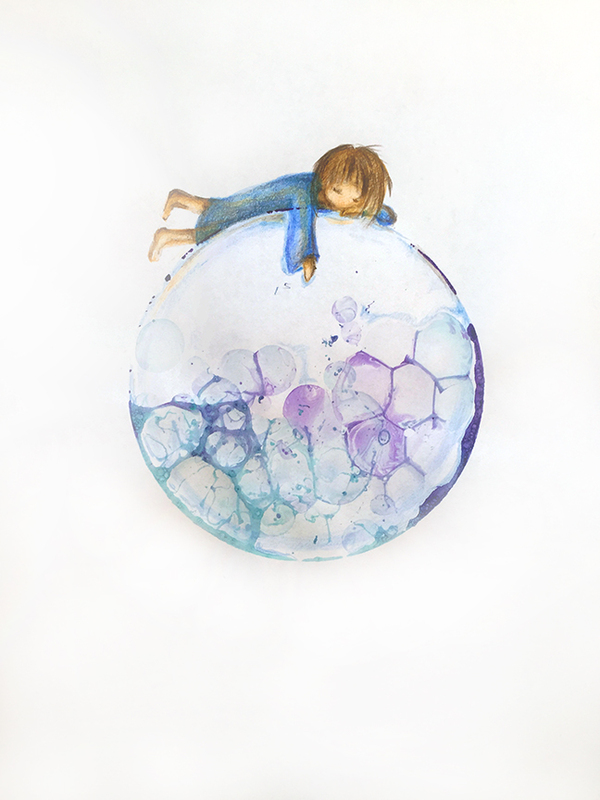 Outlining all the little sleeping fairies that were found sleeping inside the soap bubbles. Part of the soap art July series. 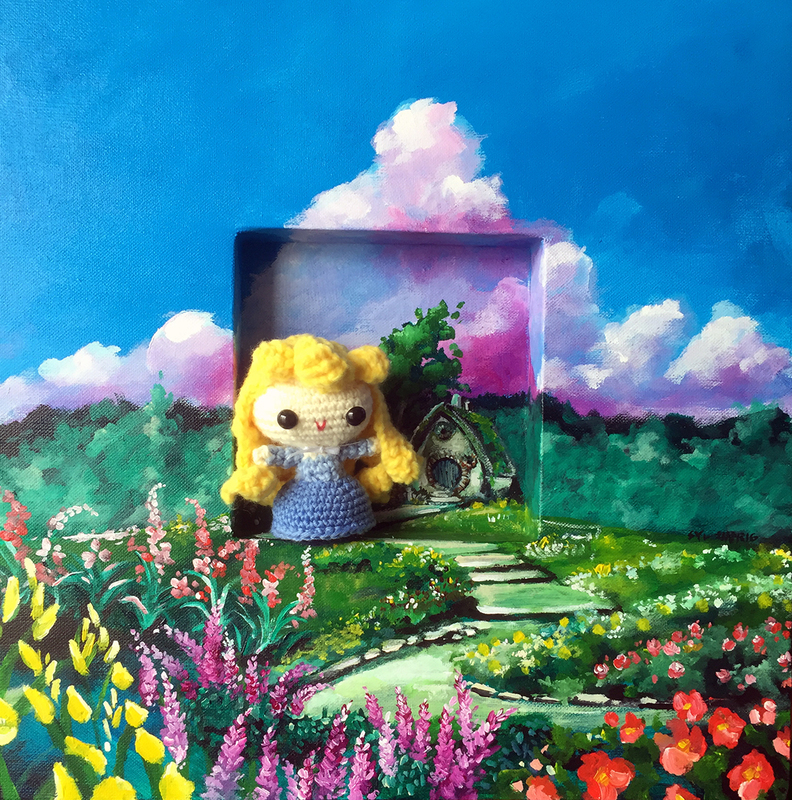 This one was inspired by Alice in Wonderland. Somehow, I always get the rabbit and the mad hatter mixed up into one character ;-P This piece was also inspired by the “Smoking Hare” piece that I produced a few years back. Another beautiful soap art creation in partnership with Herb Wong. 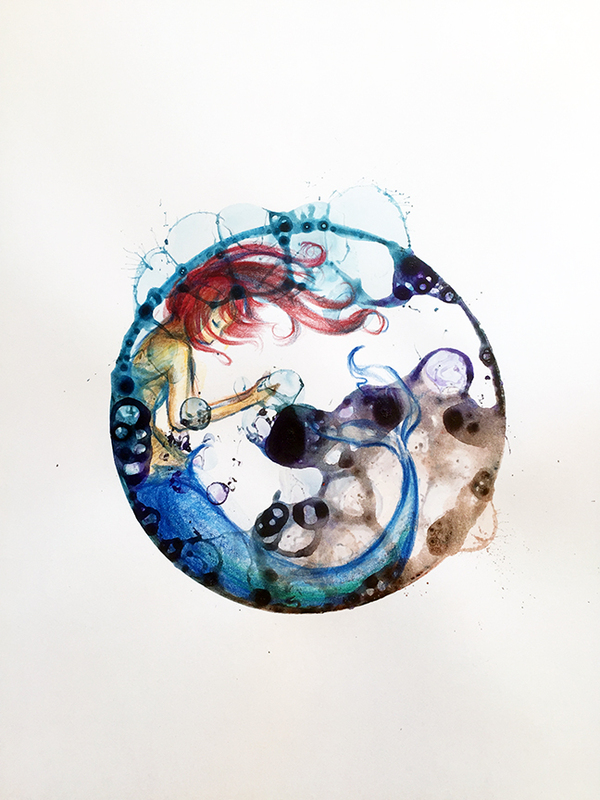 With soap art, every piece is unique and can not be reproduced. 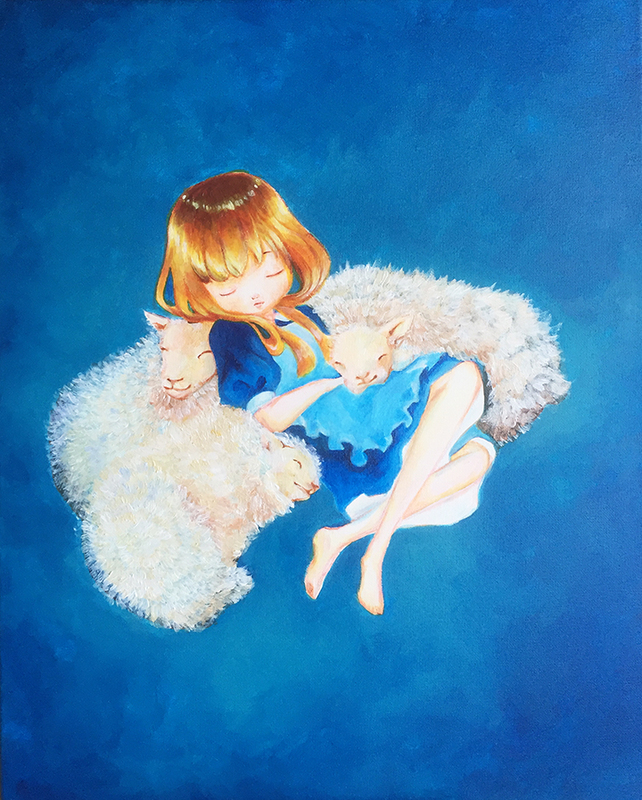 This piece symbolizes the beautiful childhood innocence with all doubts casted aside. Thank you to Herb Wong for helping with the midnight creation of this instalment of soap art. 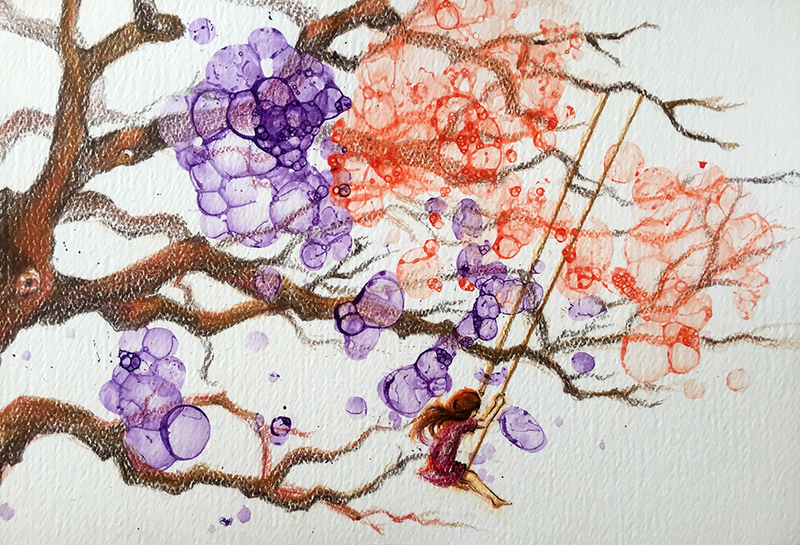 This piece was inspired by the childhood memories of freedom and bliss while riding on a swing. A childhood where you are never afraid to take a good swing at something new. 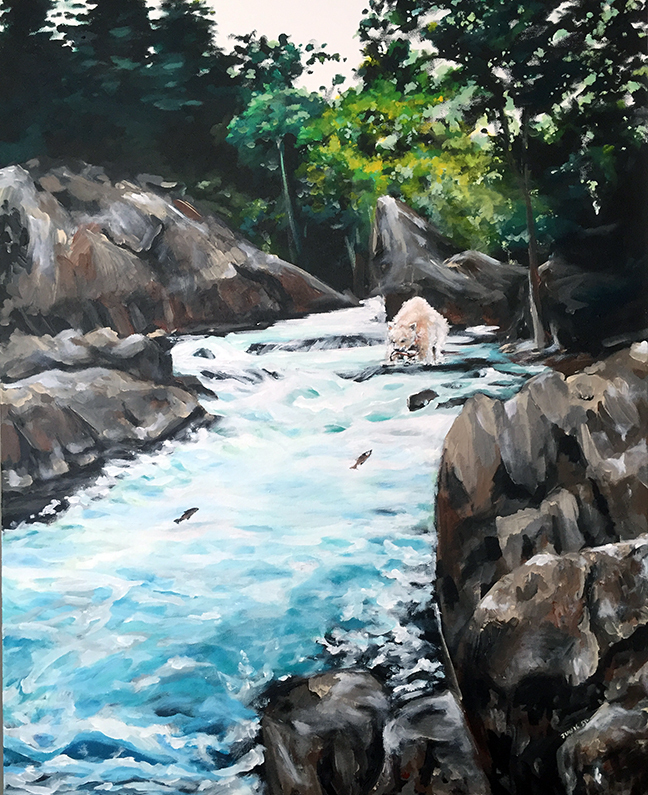 Inspired by the beautiful British Columbia and its local resident, the spirit bear. Never forgetting that nature is art. I am on a roll today! 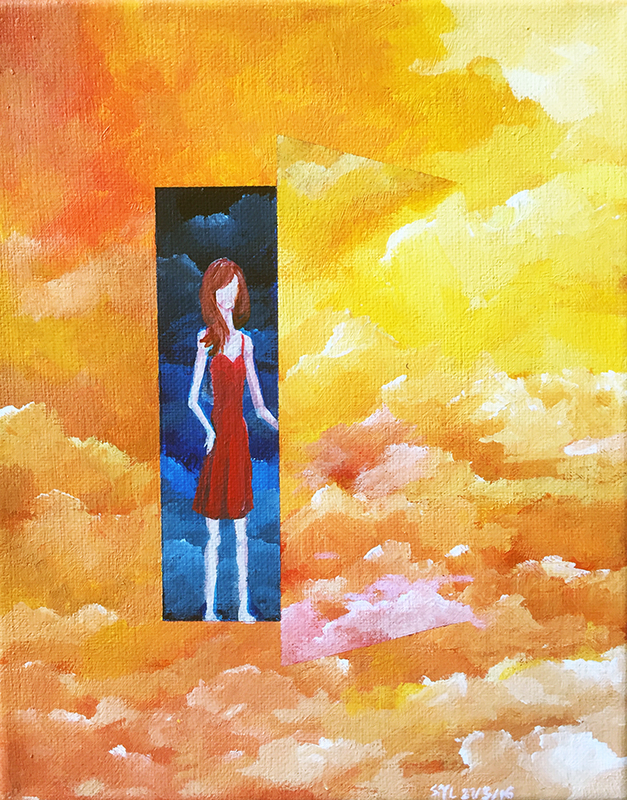 This is the second piece for the day and I have been wanting to paint this idea for a LONG time. There are always occasional orca sightings near the waters of Vancouver. 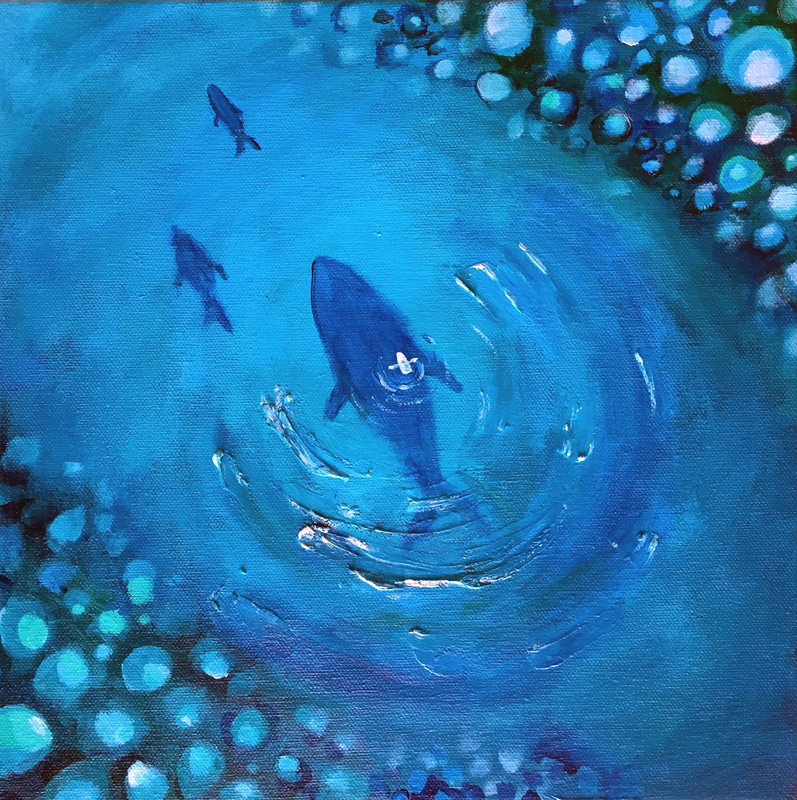 Wouldn’t it be wonderful to be sailing on the waters and then realize that there is a pod of whales swimming along sides? Well, the idea sounds cool right now, but I’m sure that it would be another matter when it actually happens. Still….Sailing with the majestic giants of the sea. That sounds pretty awesome. Just getting back into the swing of things after taking a break to work on another project. I thought I would start off by trying some abstract art again. I recently purchased some molding paste and have be eagerly waiting for the perfect opportunity to use it. I have been fiddling with the idea of using molding paste to create 3D effects for flower petals for awhile. It was easy enough to apply the molding paste, but getting into the groove to paint these peonies took longer than I expected. Loving how the paint POPS on top of the molding and inside the crevices! 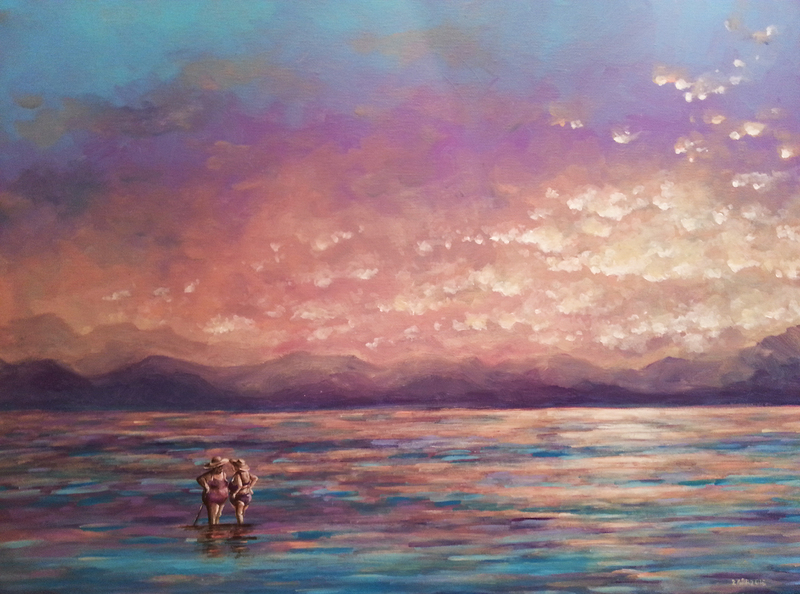 It just so happens that a pirate ship full of kids sailed by when I started painting this. There was alot of laughter overflowing out of the ship. I couldn’t help but capture their course as they broke into the still water, creating these delicate ripples towards the shore. It took longer than I expected to find the perfect species of leaf to create the right paint texture. 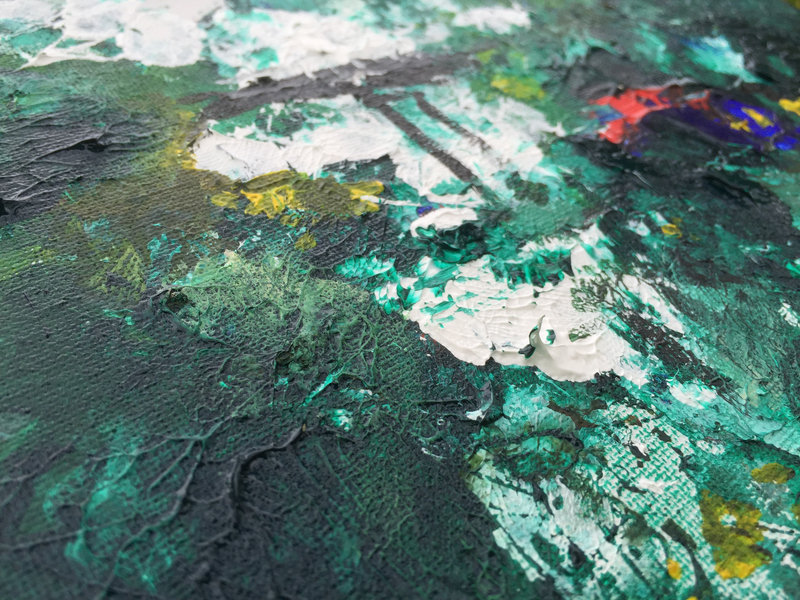 I must say that it is very challenging to paint abstract. 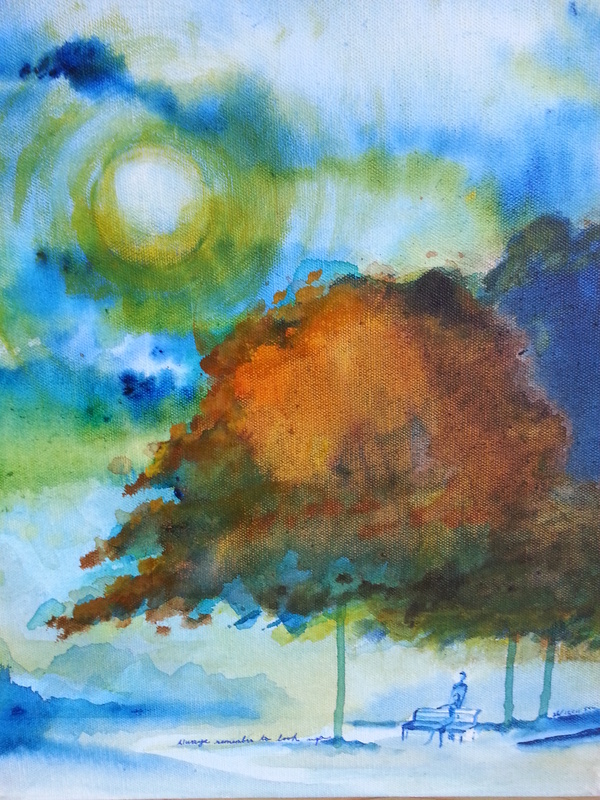 This was a last minute painting that I painted on a whim. 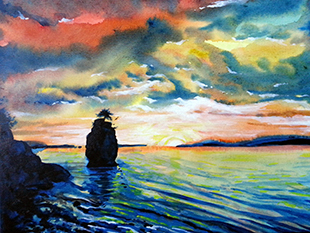 It turned out better than I expected.I especially like the nice blend of colours that I had for the sky. This is another abstract piece that I rarely do and is alittle outside my comfort zone. 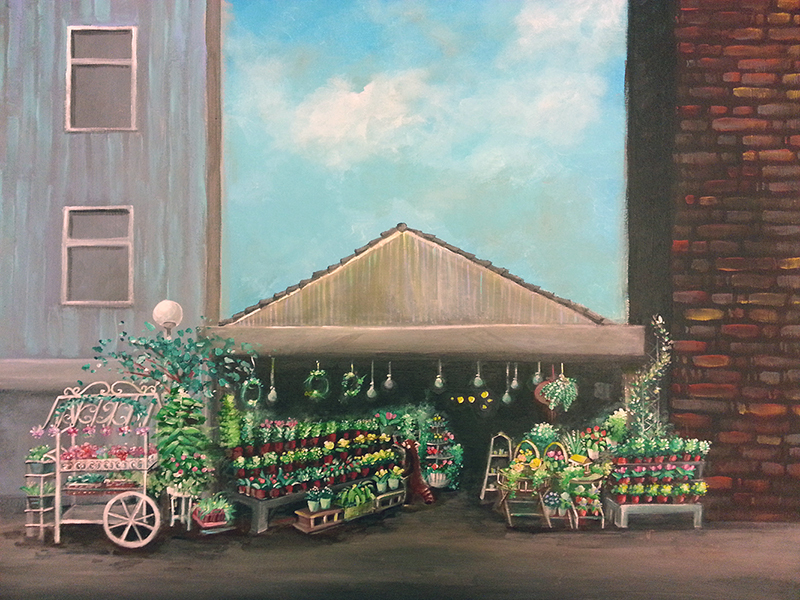 My first piece for the month of May was done at none other than Granville Island, Vancouver. 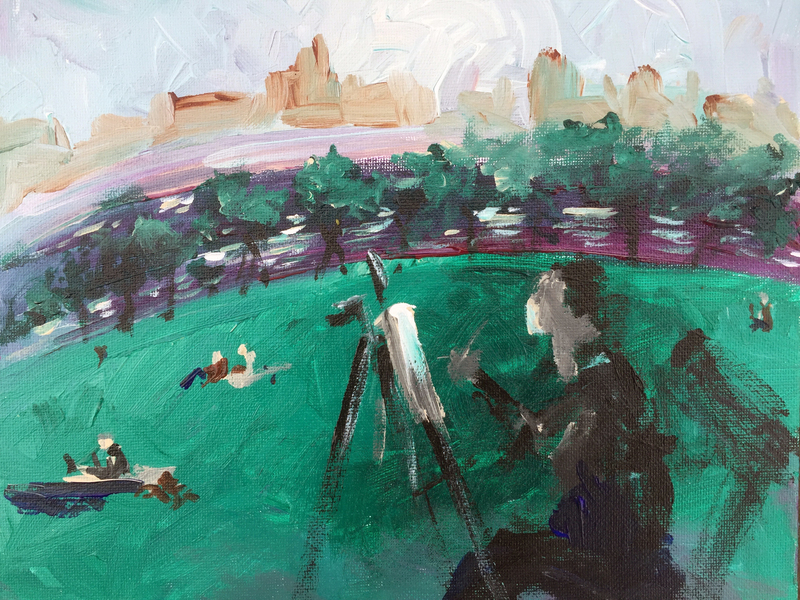 Opus recently had their annual outdoor painting challenge on May 15 and this painting was born as a result of it. 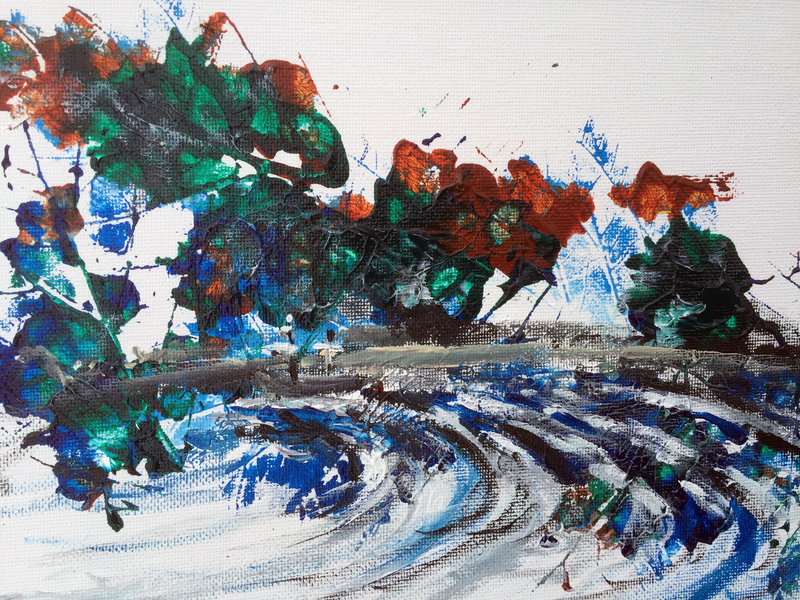 Abstract art is an area that I have little experience in, but I thought that I would give it a whirl. I love the way the leaf prints created texture for the painting. This is my 2nd ceiling tile art piece. 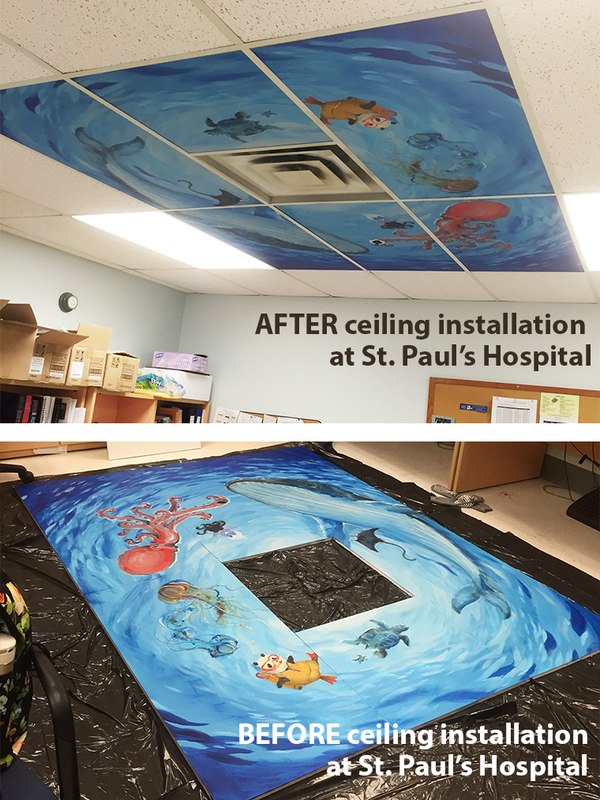 Thank you to once again to Bruce from maintenance for cutting the tiles and installing the piece! Thank you also to Mike for your help! You guys are amazing! Also a big thank you to all the staff members who has graciously allowed me to add a splash of colour to the office on 7th. This is my first ceiling tile art piece. 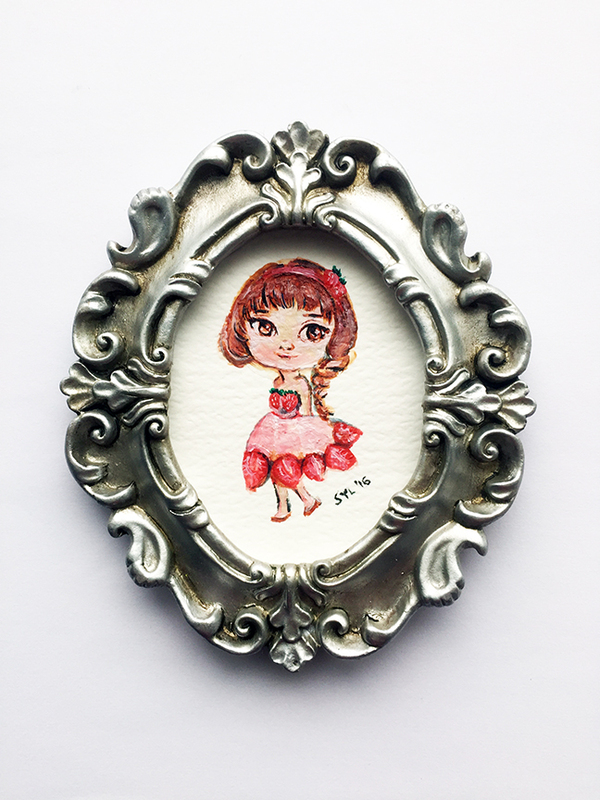 I wanted to bring a whimsical component to our work place and make it more playful. The idea is to have our own personal aquarium above our office. One that we can view at our leisure when we want a break from work. 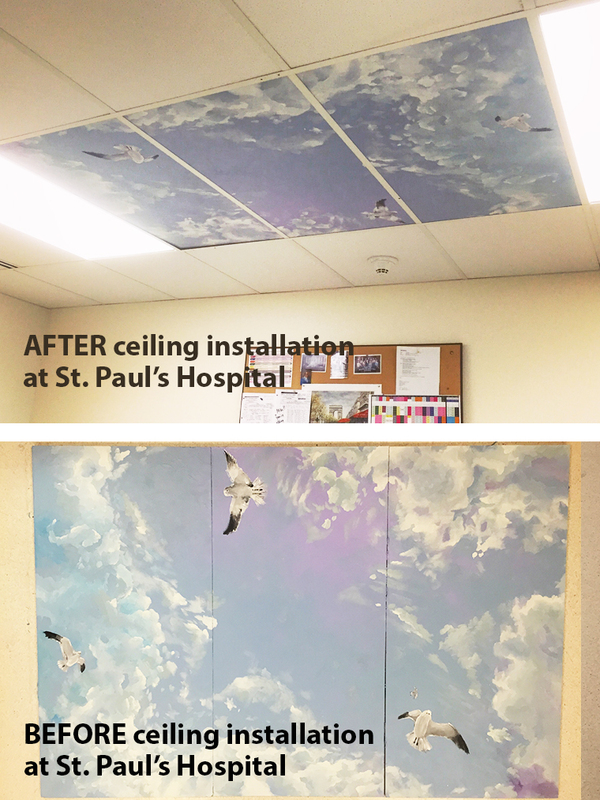 Thank you to Bruce and Russ from maintenance for cutting the tiles and installing the pieces! You guys are amazing! Also a big thank you to all the staff members who have been so supportive throughout this process and inviting fellow colleagues to visit the piece. Thank you everyone! I feel so lucky to have this opportunity at the hospital. This is my third princess theme artwork. 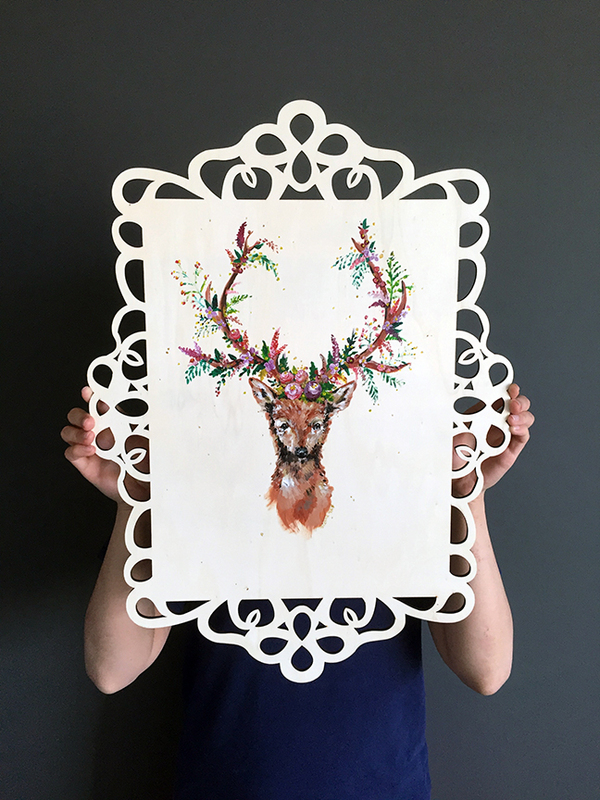 It is also painted on a thicker canvas with a deco shadowbox. Thank you to Herb for the wonderful idea! This is my submissions for the annual Piece of Mind exhibition. Psychological health is a journey of self discovery and it involves changing one’s perception. 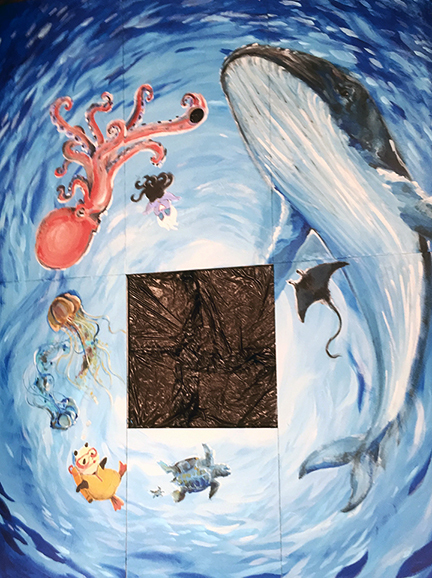 These two pieces of artwork portray this process of transformation as one climbs out of the abyss to a place of light and hope. 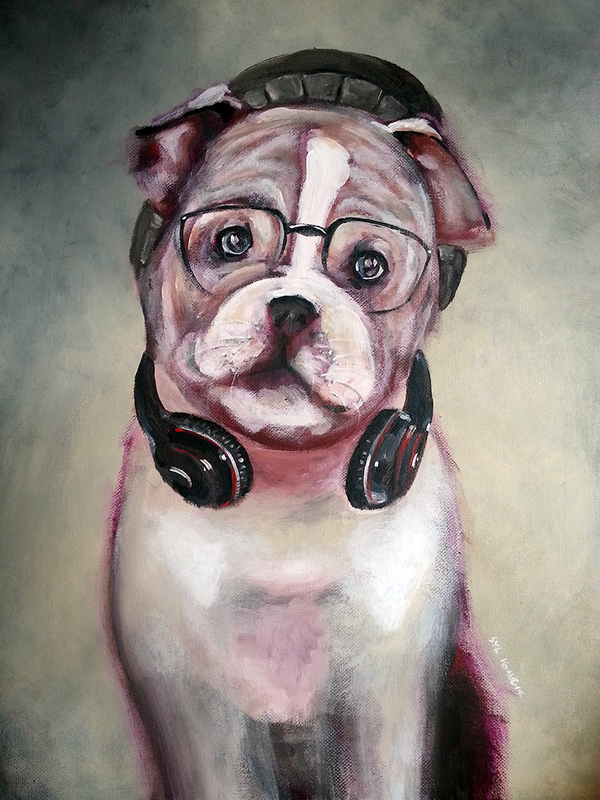 My wish is that my art can also help remind healthcare providers of the multiple perspectives to consider when serving such complex individuals. This is my second princess theme artwork. 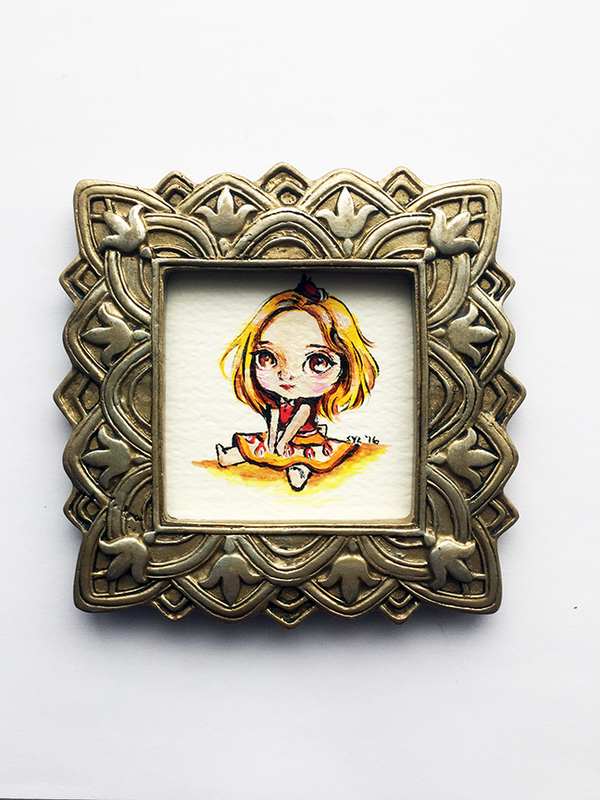 It is also painted on a thicker canvas with a deco shadowbox. 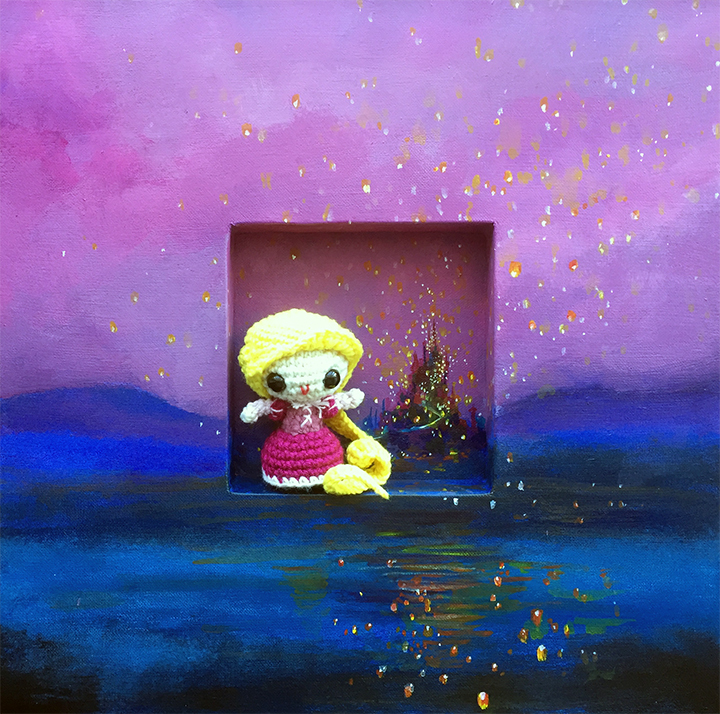 Again in this piece of artwork, I integrated my interest in crocheting together with my painting. It would have been nice to make Rapunzel’s hair alittle longer, but I think it still looks amazing. This scene from “Tangle” is one my all time most memorable Disney screenshots. I had alot of fun painting the castle and the lanterns. 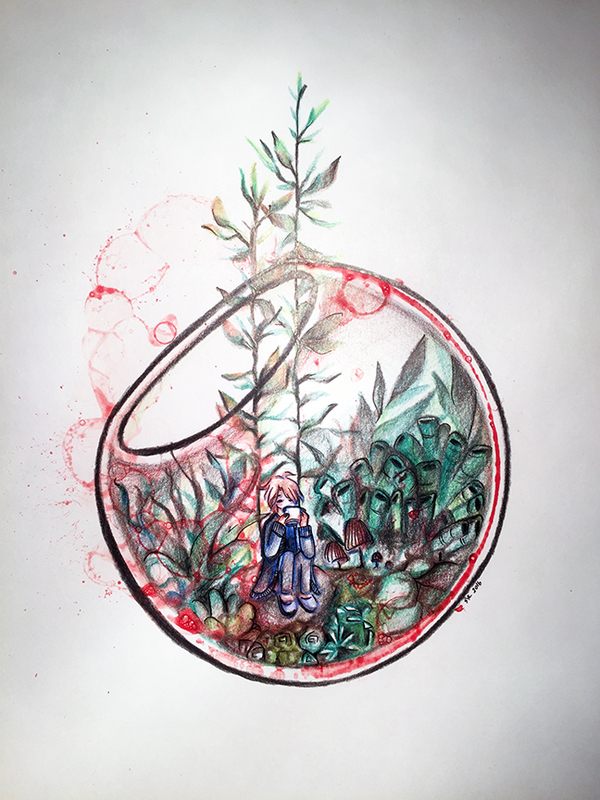 This piece signifies a new start for me. This month, I invested on some professional grade acrylic paint and the resulting colours look AMAZING! It fits perfectly with the colourful under the sea theme, not to mention, the extra investment on a thicker canvas with deco shadowbox. I am very happy with the results. 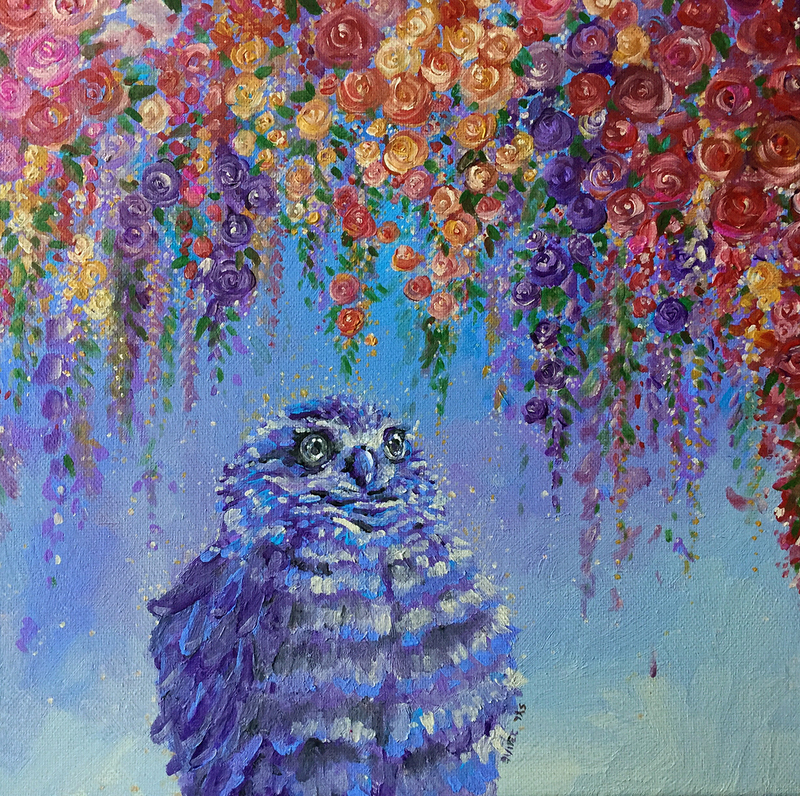 In this piece of artwork, I integrated my interest in crocheting together with my painting. 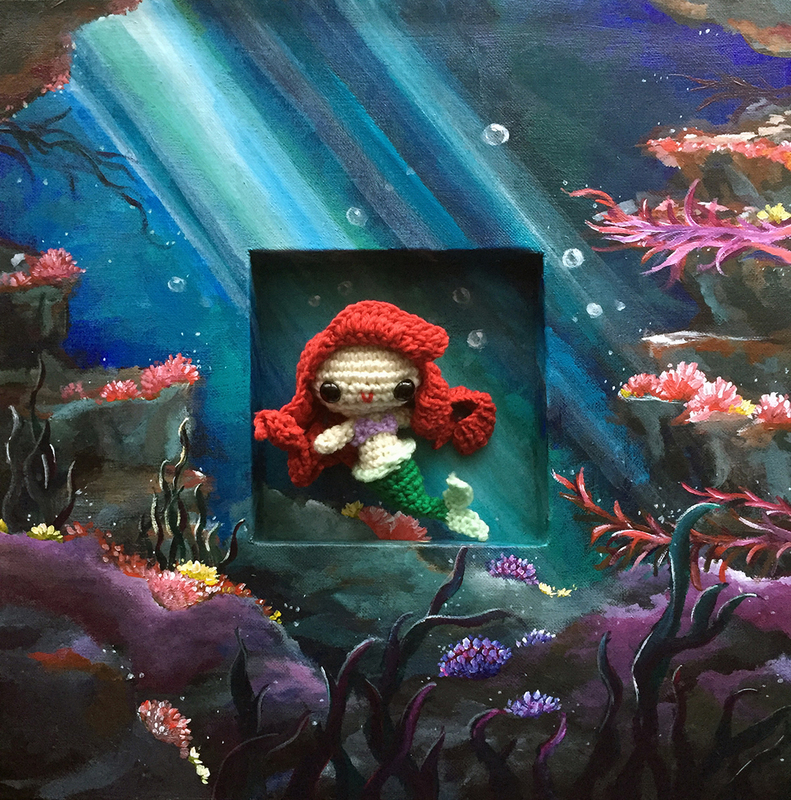 I must say that the mermaid doll looks absolutely adorable and it was so much fun to make. 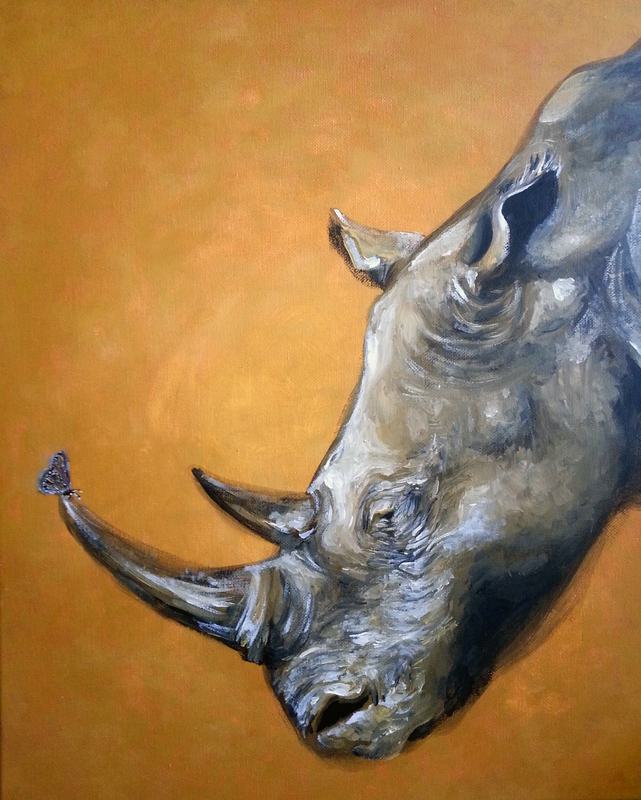 This piece was painted specifically for my first art show coming up at the ROAM Gallery (Feb 10-March 8,2016). The theme for the show is “Love is…”. 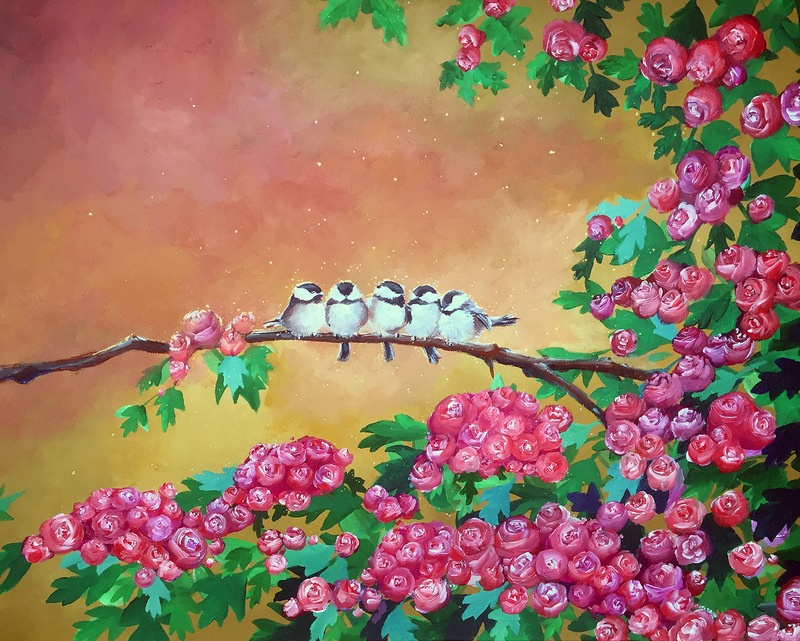 Hawthorn, also known as the May flower, symbolizes strength & hope, and chickadees represent joy. 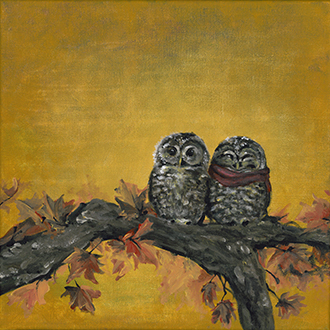 May the bearer of this painting find strength to love the present, and hope for the future. Lastly, may he/she find joy in the discovery of love. To commemorate our beautiful Vancouver. We don’t have to go far to see something beautiful. I finally crossed off “Life of Pi” from my checklist of “must-watch” movies this weekend. Over the years, I’ve always heard lots of great things about the book, but I have never been able to sit down and read over the large volume. Incidentally, I settled to watch to movie as I was too lazy to read the book. The movie was breath of fresh air, full of beautiful imagery that captured my imagination. 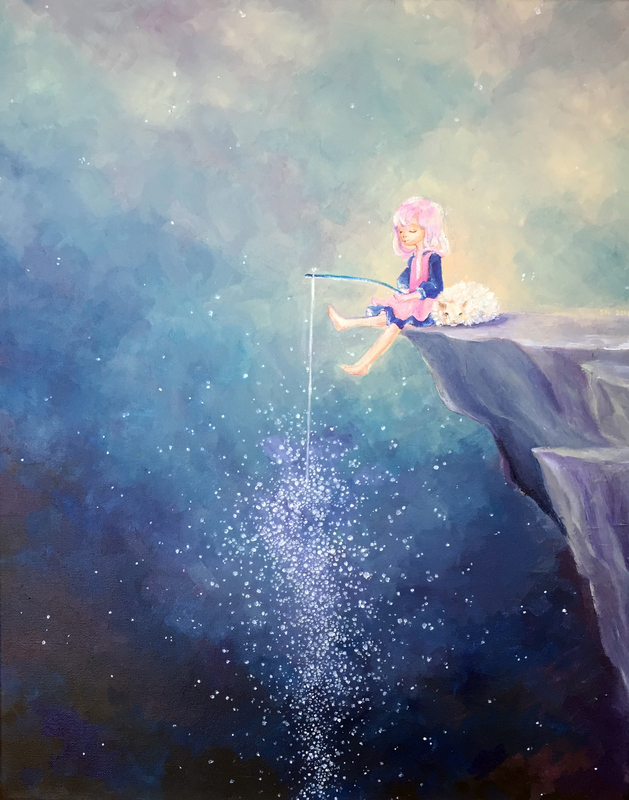 This painting was inspired from one of the most magical scene from the movie. It’s so dark and grey in Vancouver lately. Let’s add some colour to the day! It’s so hard to fight those sugary- cravings at night! It’s so nice to sit down with a hot cup of tea when the sun is glowing outside. Can’t wait for March to come along when the sakura are in full bloom! The cold has suddenly set in. It sure would be nice to sit under a kotatsu and enjoy the scenery with a hot cup of tea. 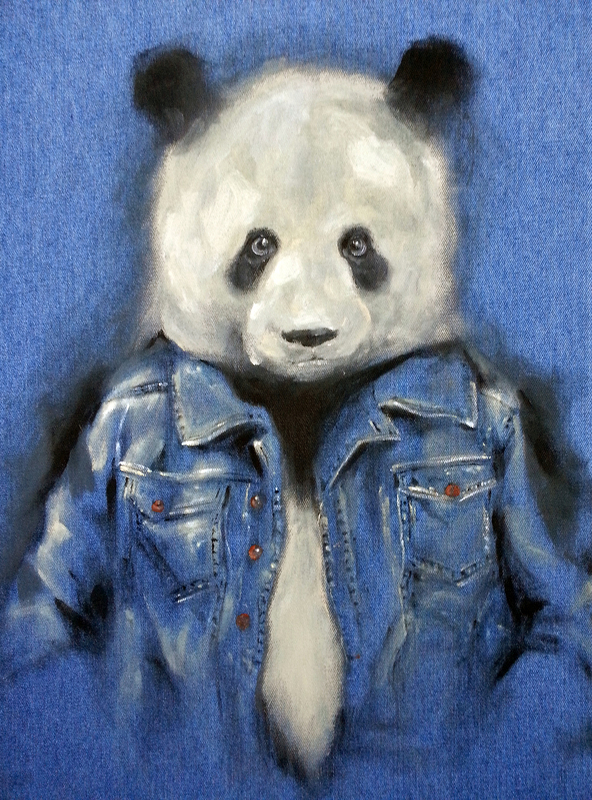 I recently acquired a lovely piece of denim stretched canvas and I just couldn’t help myself from painting Peter in a brand new denim jacket. Happy September! 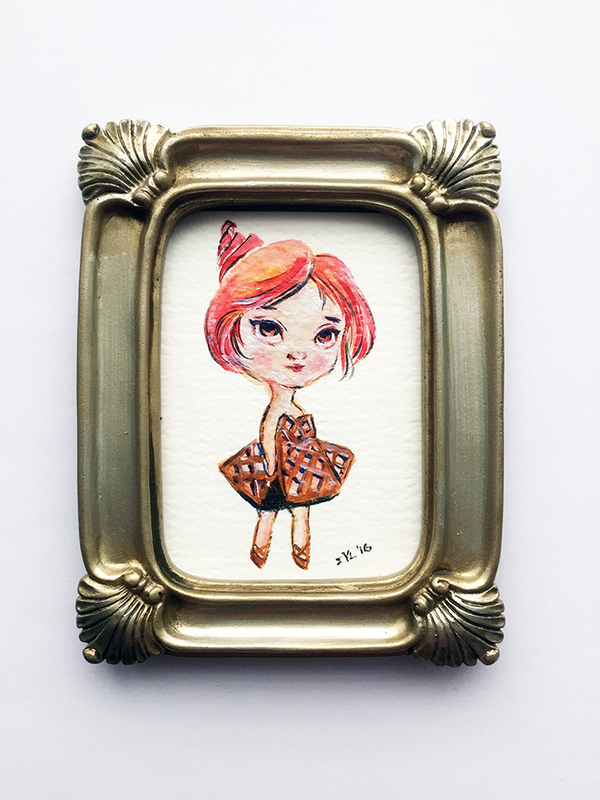 The idea of painting on veneer wood popped up from a recent trip to Chicago with my friend Jane. I tried to leave the grain of the original wood expose to where-ever fits the context of the tea party. It was much harder than I imagined to paint the “negatives” for the backdrop. 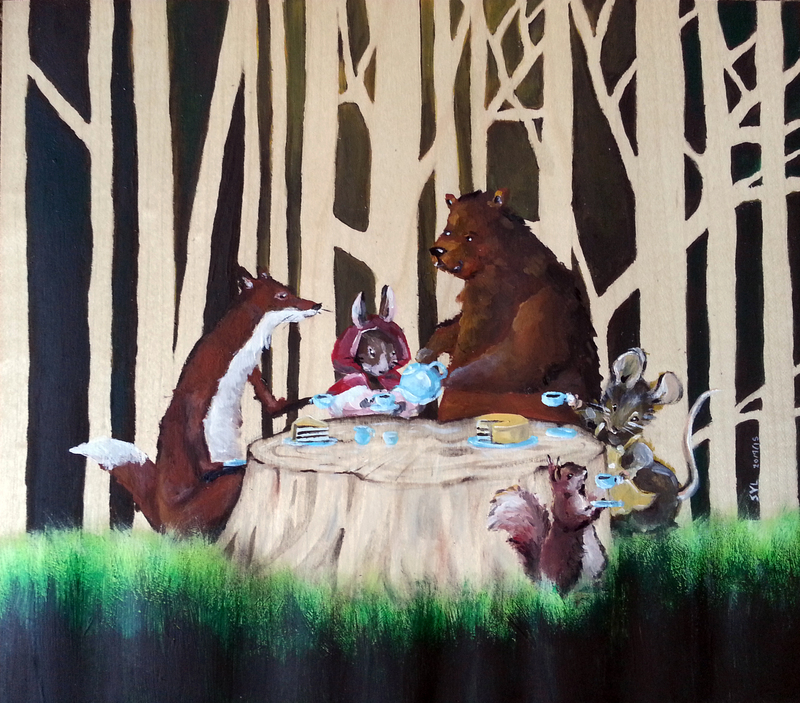 In the end, I’m pleased by this new piece and hope to have more pieces painted on veneer wood again in the future. Don’t these birds look like cotton growing on a branch? So peaceful and magical at the same time.Feels like the beginning of a new start. The lazy summer has just rolled in and sometimes, I just want to lie in front of a fan and eat yummy sushi. We used to have an old dial phone at home when I grew up. I don’t call recall seeing one again in the last 20+ years. 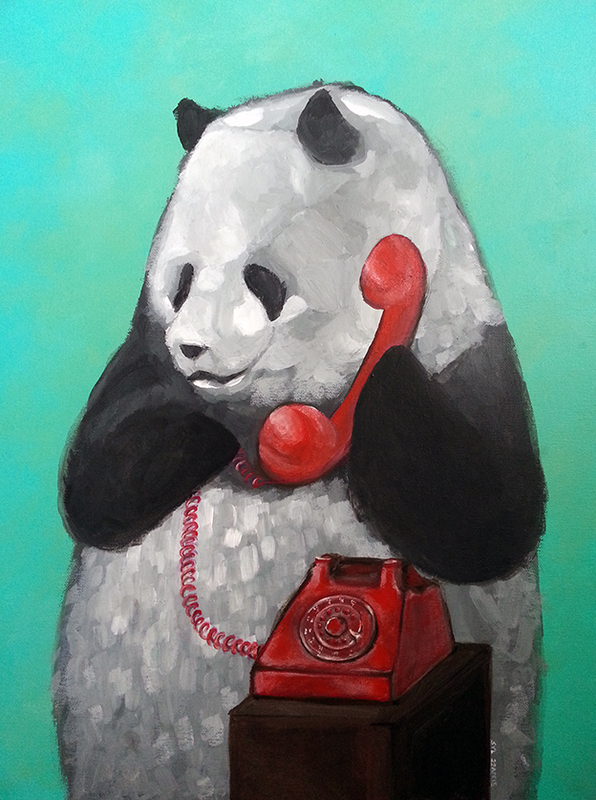 I drew this to commemorate the rotary dial. Even when we grow older, we will still be friends and sharing the magnificent sunrise together once again. How about a change of pace? 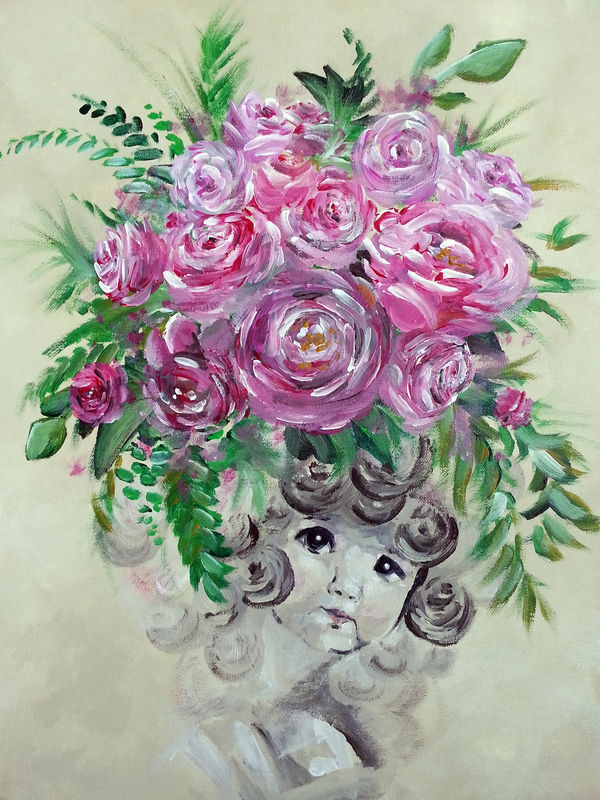 The style of this painting deviates from my norm because I had wanted to try something different. My childhood friend used to own a Sylvanian Family doll set (complete with doll house) and I used to adore looking at it. 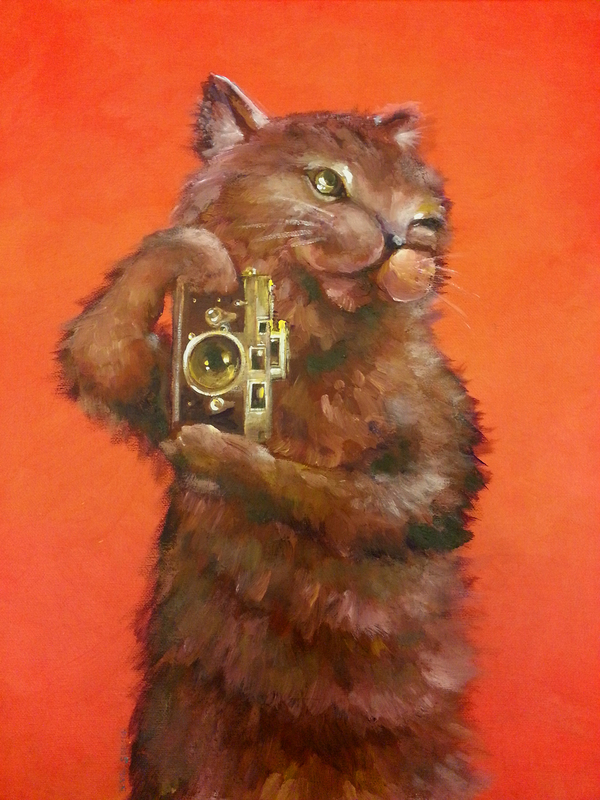 This painting is a play-off of the charming Sylvanian Family doll set. 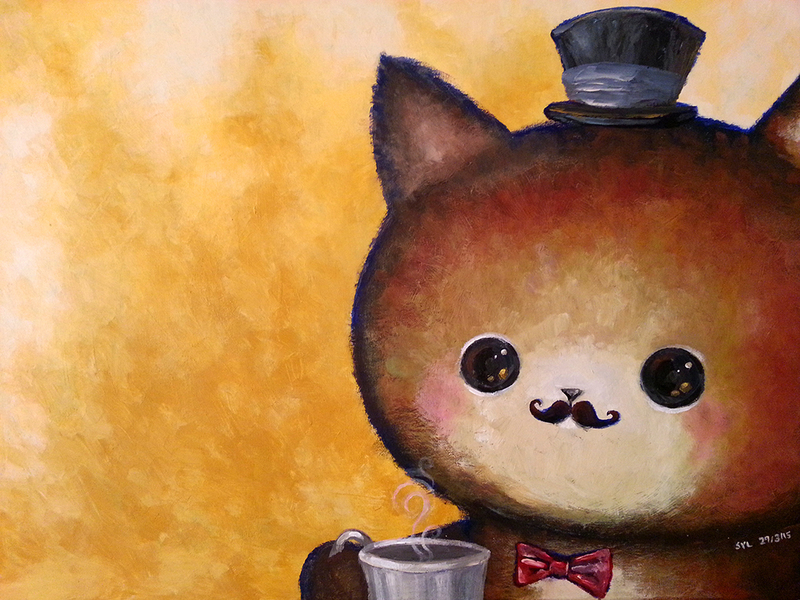 Monsieur Chat is a sophisticated feline who enjoys a hot drink indoors during Vancouver’s March showers. It’s been a long while since my last painting because of work and also my big move to Lulu Island. The Panda Express is my first piece of the new year. 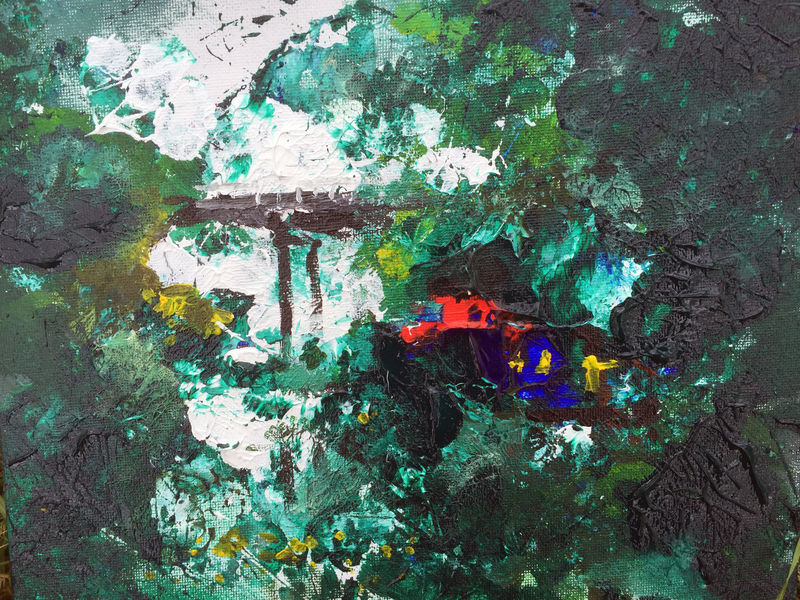 The idea of this painting is derived from an antique train set that my family used to own. We used to take it out and watch it run once a year. Since moving to Lulu Island, I’ve been hearing the chu-chu-ing of the trains almost every evening before going to bed. The sounds of this train reminds me of the toy train that my brother and I used to marvel over. In particular, I was intrigued by the intricate details of the doorways and the petite features of the train engine. I remember thinking- I wonder where they have this little workshop full of earth fairies that build the trains? With everyone’s busy lives nowadays, who has time to stop and smell the flowers? During my recent trip to Korea, I ran into this gorgeous flower shop tucked away in a small street. For a minute, I stood there in awe marvelling at the flower shop. I wonder how often do I pass by these unique places in Vancouver and never stop to appreciate its beauty? 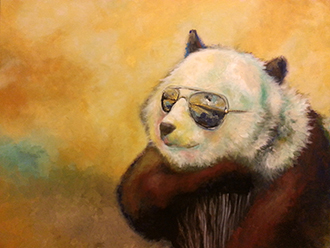 This painting is the second in the installment of the Traveling Red Panda series. 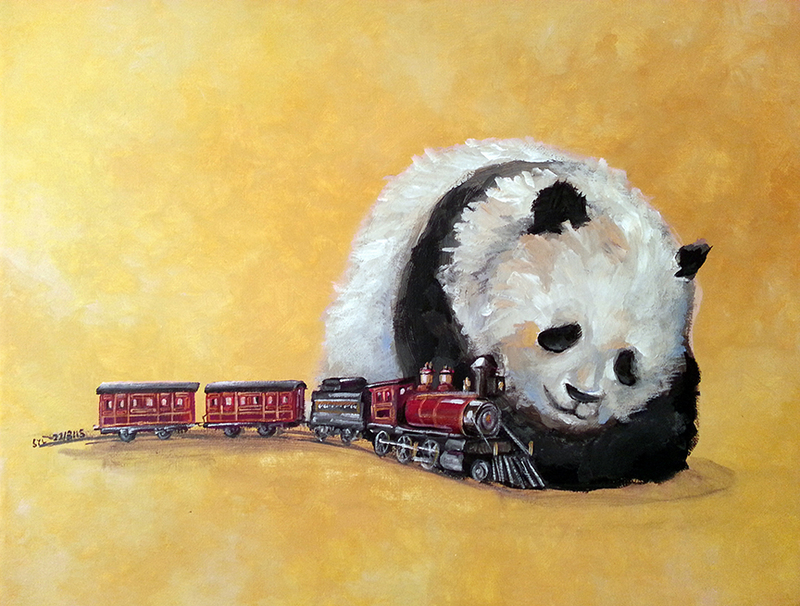 This painting is the first of the Traveling Red Panda series. 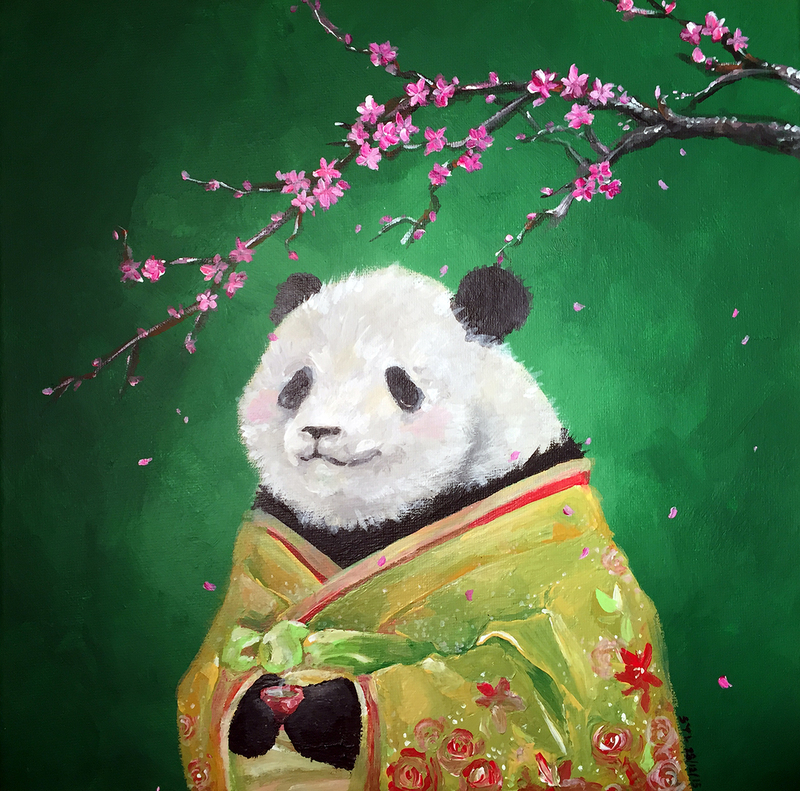 This series follows the travel of our dear red panda through Asia as it makes its way to meet its giant panda friend (see Traveling Giant Panda series). 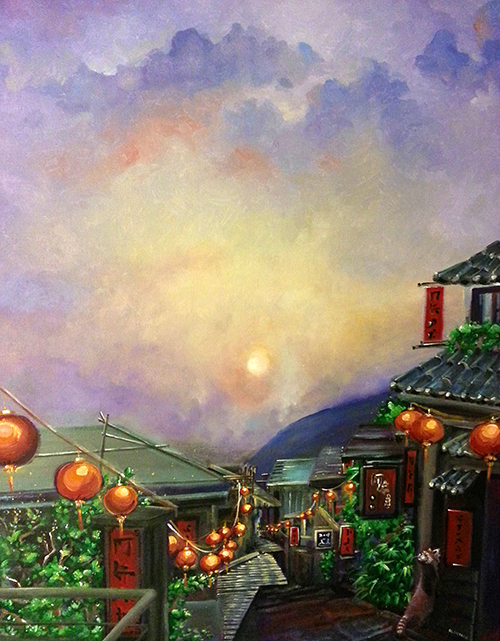 It is inspired by my recent trip to Jiufen (a mountain area in Taipei that was also the inspiration for Hayao Miyazaki’s anime film, Spirited Away). It was a wonderful and inspiring trip to the beautiful country of Taiwan. I simply loved the idea of dancing to your own beat and swinging to your own rhythm. It’s hard to do some times and it may even look foolish at times. But dang, does it feel good. So does it really matter what others think? It’s nice to huddle together with friends and just do nothing some times. It doesn’t need to be anywhere fancy. Some things are just blissfully simple like that. Growing up in a family with two generations of being in the classic camera business, it is no wonder that I’ve been fascinated by classic cameras as a child. This is one of the cameras that I didn’t really like as a child, but have slowly grown to value its uniqueness as I’ve grown older. 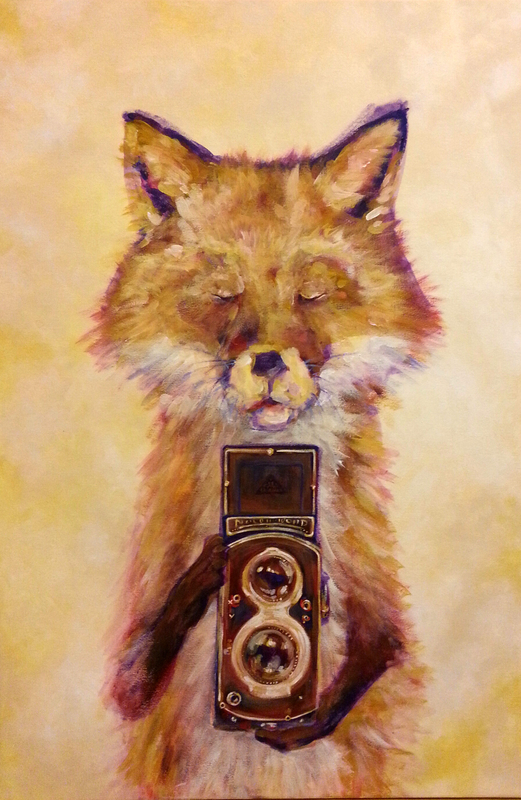 This painting was on display at Pizzeria Barbarella. Inspired from a trip to San Diego’s Safari Zoo. Ever feel like just sitting and looking out at the beautiful nature of things? I feel like I do less and less of that nowadays. 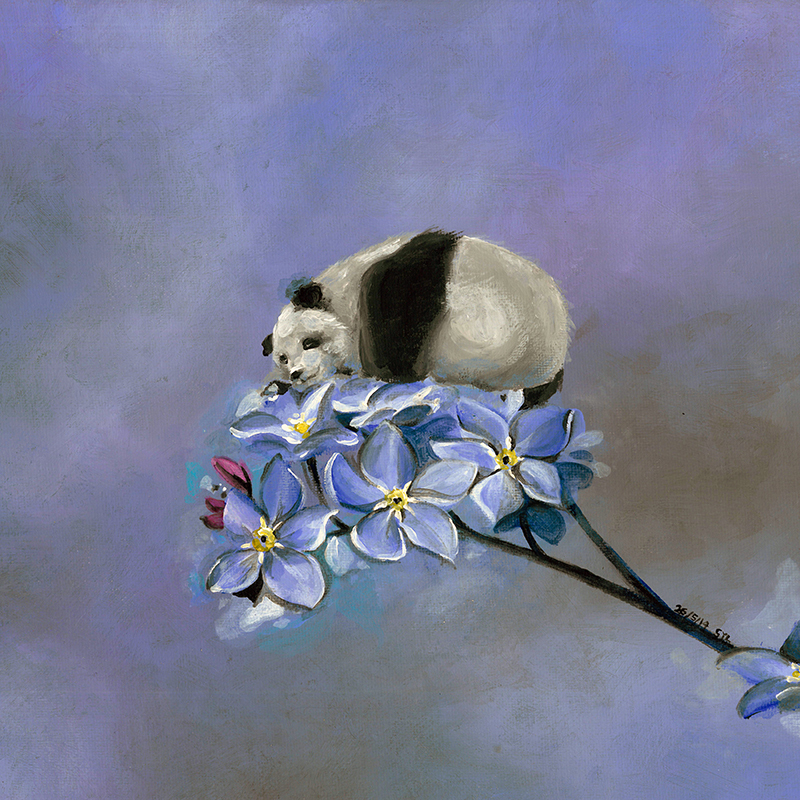 This painting of a panda sleeping on a forget me not flower symbolizes the delicate balance of the animals that are on the brink of distinction. It is in reminder that we share this beautiful planet together with many other life forms. 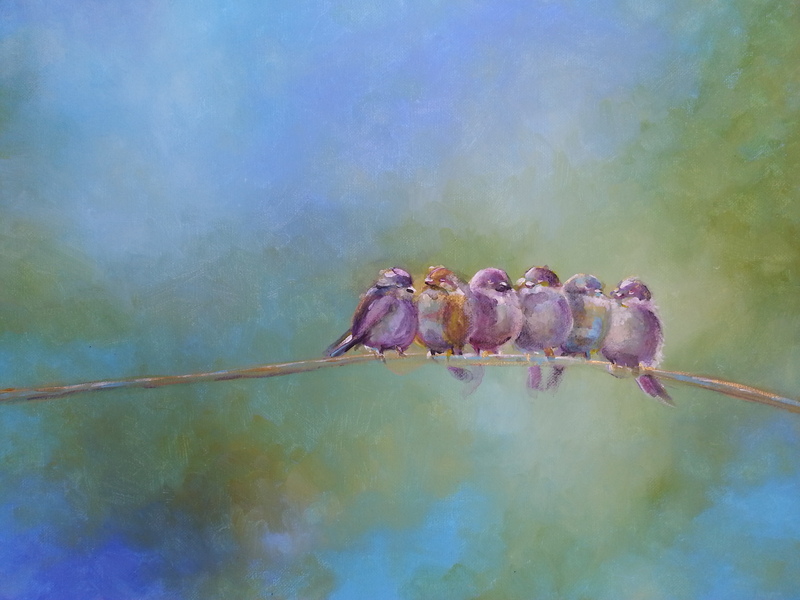 This painting was on display at Baguette & Co.
Falls was in the air, but it’s time to cozy up with close pals. 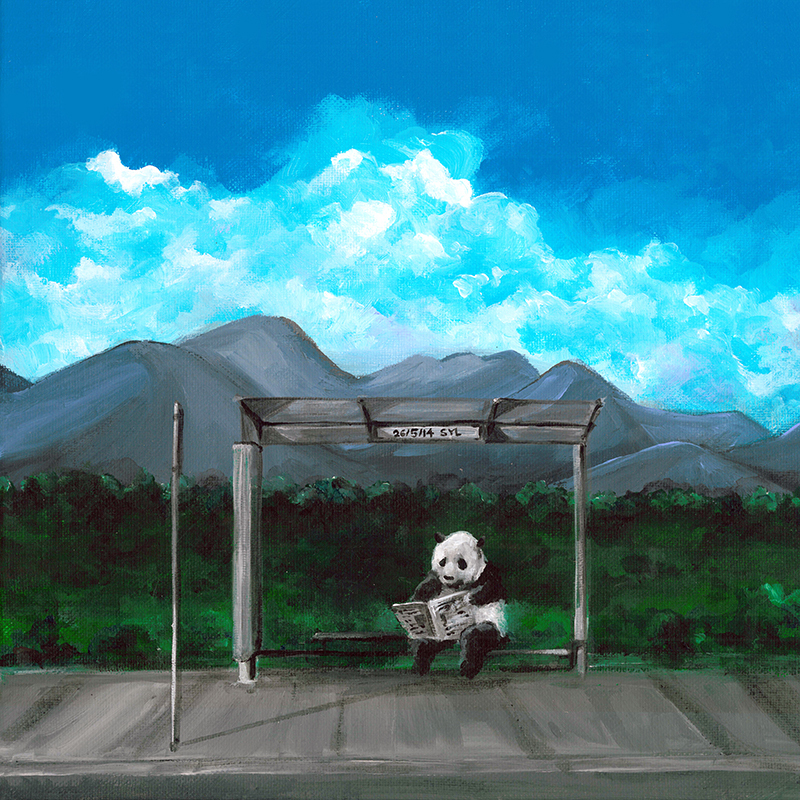 This painting is part of a series where a giant panda travels his way around the world. 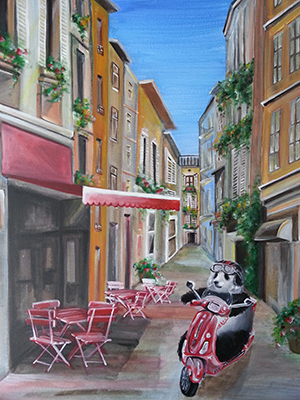 Follow our panda friend through the streets of France on his blazing red moped. Who can resist a sweet dessert? 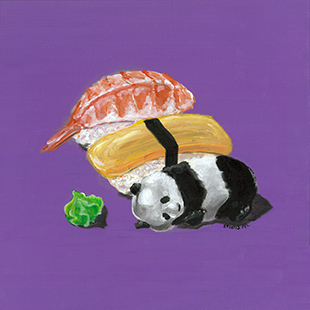 This painting was inspired in the middle of night when I was having a craving for food from one of my favourite local Japanese restaurant, Sakura Sushi. Flashback to an oldie, but a goodie painting that I did in 2013. 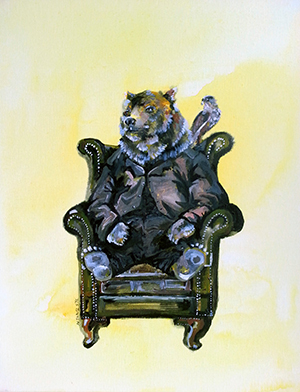 My original idea was to paint animals native to the city and having them act out everyday human activities. 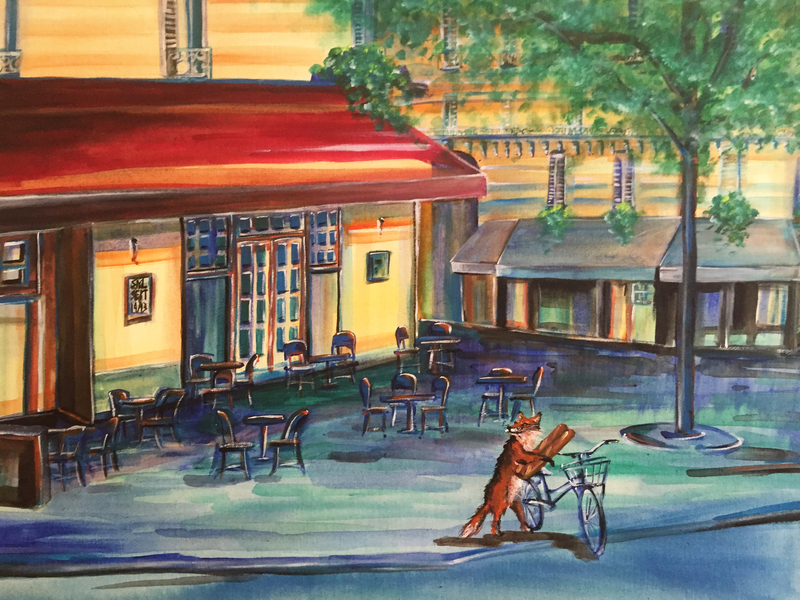 The red fox is native animal to France and here I have him cycling to buy some baguettes. Fresh baguettes are so yummy in France…….I really miss the bakeries in France. 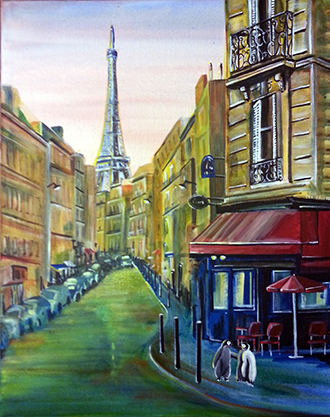 Inspired by a trip to Paris in January 2013. Thank you Bastien and Mel! 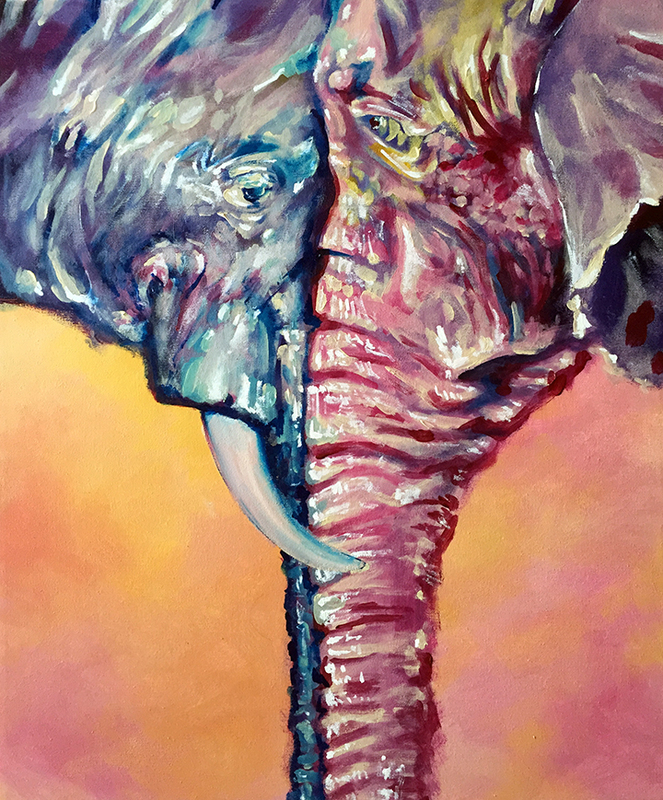 Elephants are some of my favourite animals, which is why they are the subjects in a lot of my paintings. 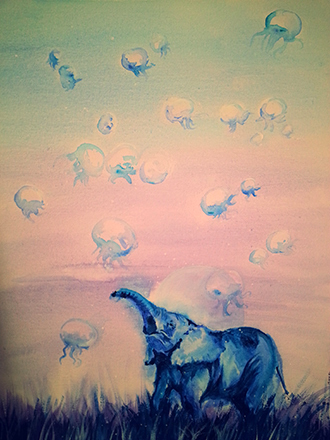 Here is a painting of a baby elephant dreaming of floating jellyfishes descending from the sky. 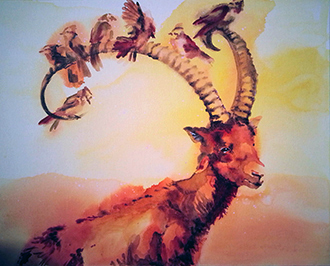 I simply love how the colours flow and blended to form these red blue jays on ibex. This is one of the paintings that drew itself and the colours just naturally played into the perfect shape at the perfect time. 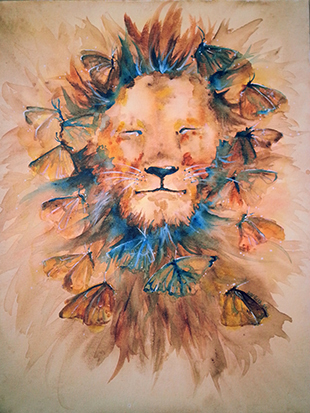 This painting was inspired by the lion from the Wizard of Oz and how finding courage can be a beautiful thing. 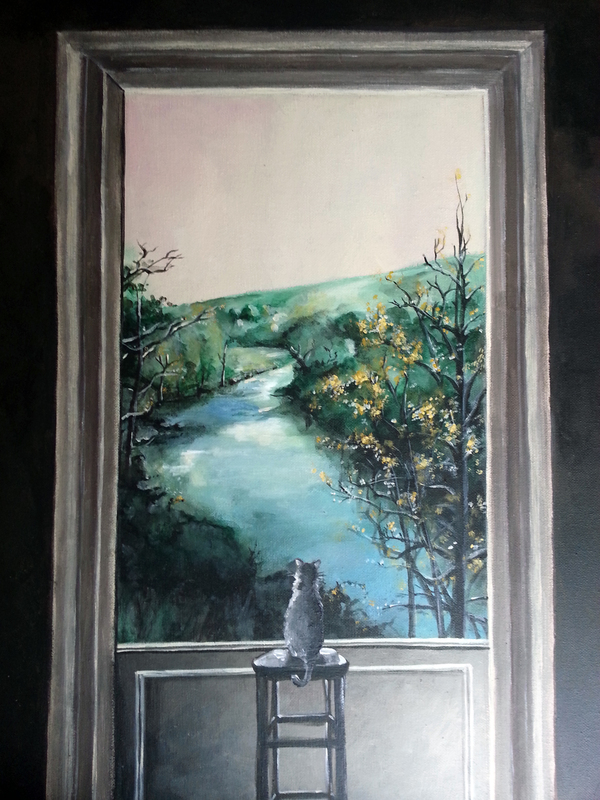 This was one of the first paintings where I started using pure raw acrylic medium without any dilution. The classy pairing of the bear and falcon was a spontaneous choice. The effect came out quite well. 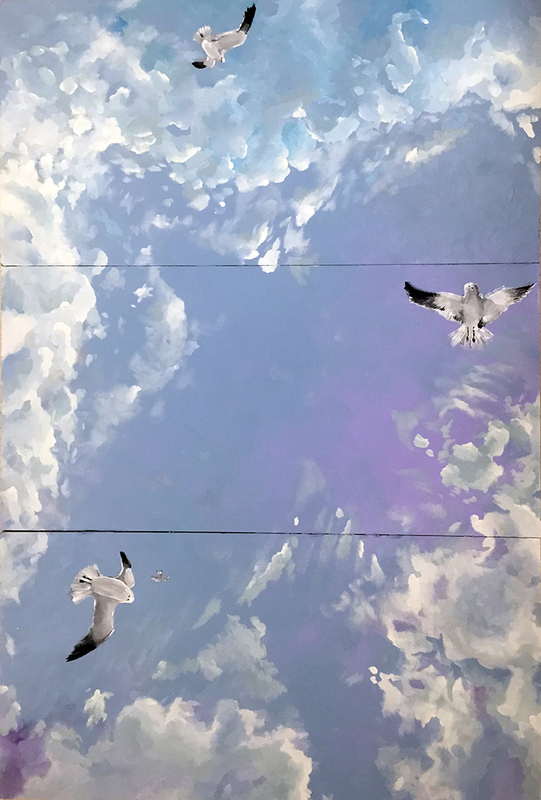 This painting was reminder to always look up and not to forget the brighter side of things. There’s always some good.